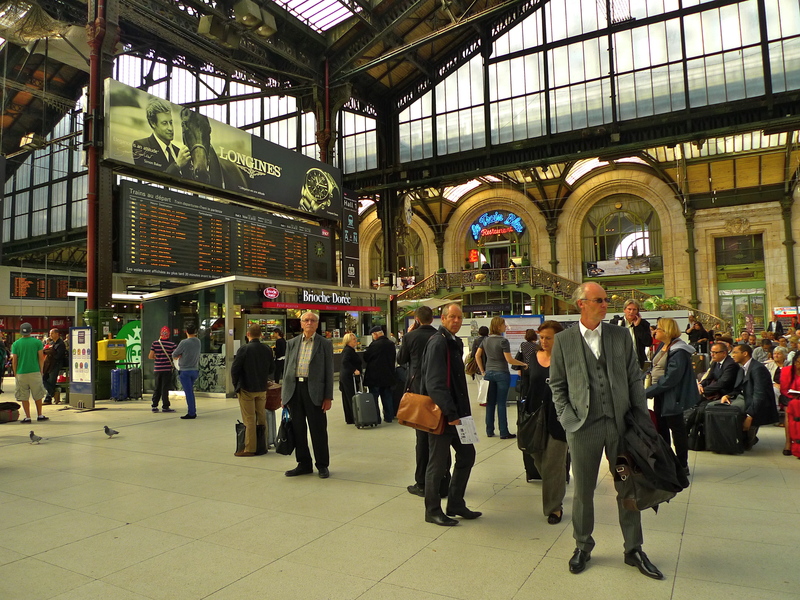 THE GARE DU NORD railway station in Paris is on the cusp of great change. Over the next few years the physical architecture of this station will be transformed and consequently, so will its sonic architecture. For many years I have been recording and archiving the sounds of the Gare du Nord. My particular interest lies in investigating how sounds can define, or help to define, a place and how the soundscape of a particular place changes over time. 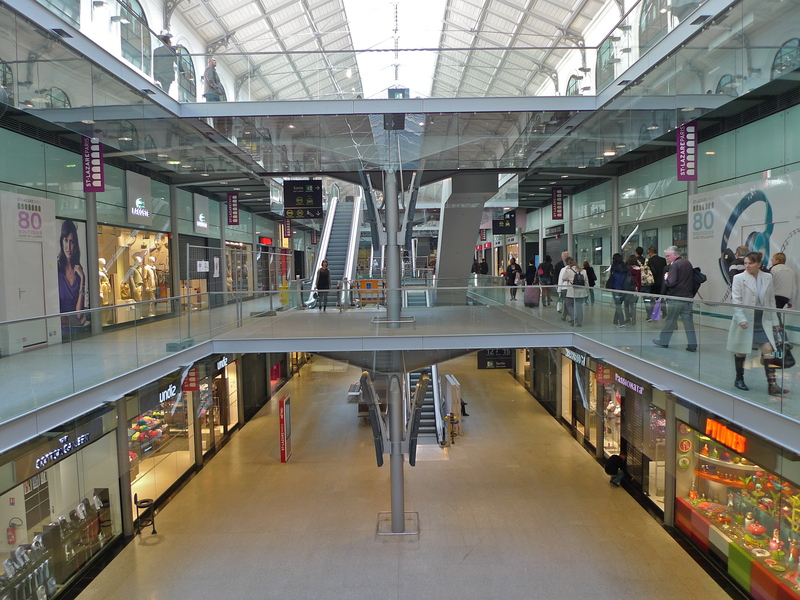 The Gare du Nord is a valuable case study in both these areas. The first Gare du Nord station was built in 1846 but an increase in traffic meant that a new, bigger station was soon required. Rebuilding took place under the direction of the German-born French architect Jacques Ignace Hittorff with the new station combining the advanced structural use of new materials, notably cast iron, with conservative Beaux-Arts classicism. Hittorff’s Gare du Nord was completed in 1864. Significant changes to the station were made in 1981 to accommodate RER Line B and then in 1993 to accommodate the TGV and the Eurostar. The last major change was 2001 with a major expansion of the departures hall. And now the Gare du Nord is about to undergo further change. 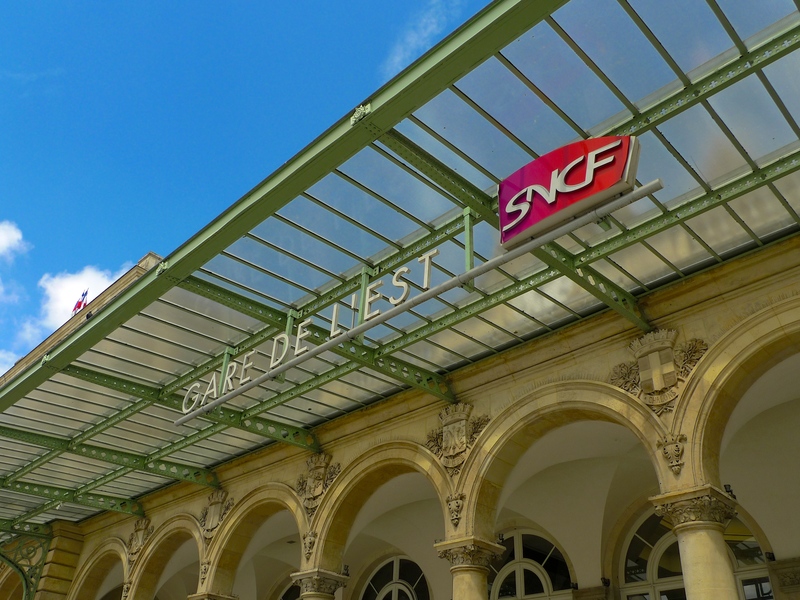 Subject to negotiations due to be concluded by the end of this year, SNCF Gares & Connections and the global real estate company Ceetrus will set up a joint venture to carry out a transformation of the Gare du Nord. Ceetrus, in association with architect Denis Valode (Valode and Pistre architects), will lead a transformation as big as that led by the Hittorff in 1864. The transformation is due to be completed in time for the Paris Olympic Games in 2024. The transformation will see the station triple in size from 36,000m2 to 110,000 m2. 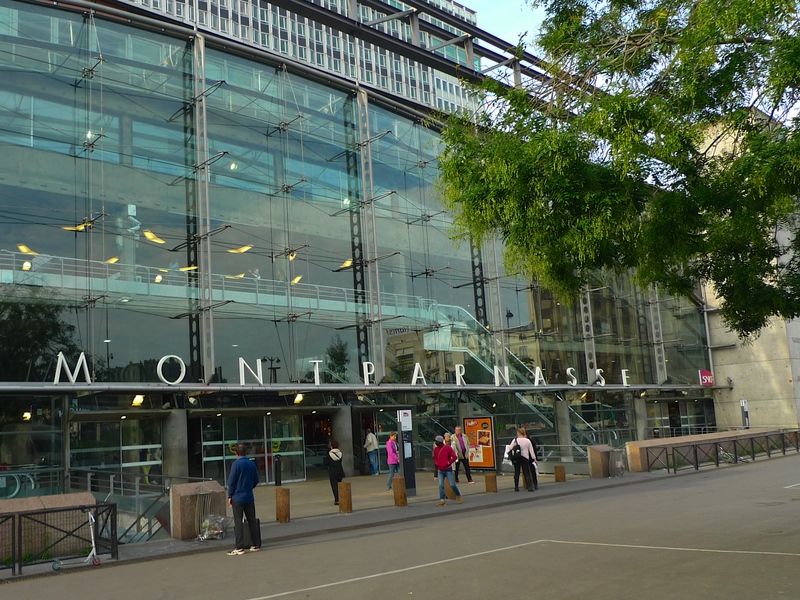 With 700,000 passengers using the station each day, excluding those who use the associated Métro station, the Gare du Nord is already the busiest railway station in Europe. 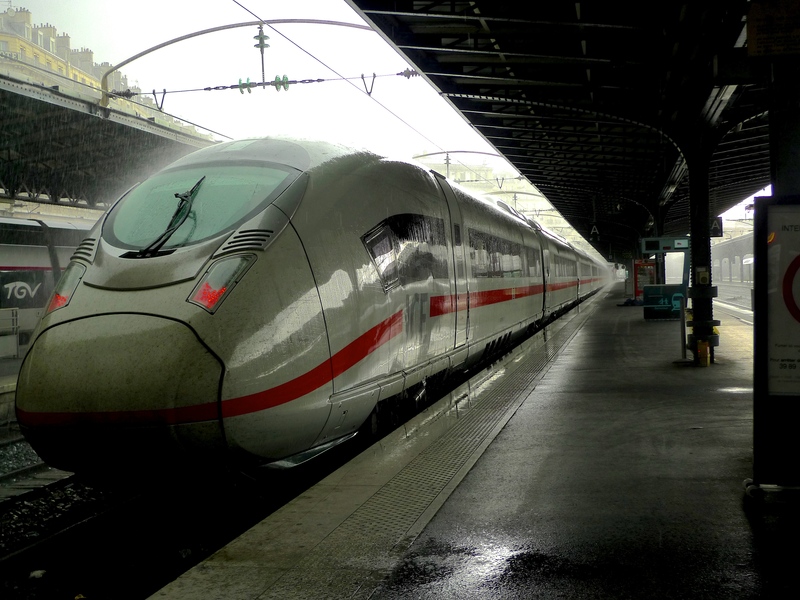 Following the transformation the daily passenger numbers are expected to increase to 800,000 in 2024 and 900,000 in 2030. The transformation will include a new departure terminal in which the flow of arrivals and departures from the station will be distinct thus improving fluidity and comfort for travellers. A new station facade is proposed on rue du faubourg Saint-Denis with direct access to the departure terminal. The Eurostar terminal will be expanded to meet the challenge of strengthened customs controls linked to Brexit. Accessibility will be enhanced with more elevators and escalators. The new station will have 55 lifts and 105 escalators. Station security will be enhanced with more CCTV being installed. Access to the three metro lines will be improved. The bus station with its 12 bus lines and 7 Noctilian services will be connected directly with the departure terminal, and 1,200 bicycle parking spaces will be available with direct access from the square in front of the station. Traffic circulation around the station will be redesigned to take account of the redesigned access to the station and also the expected development of new electric mobility solutions. The transformed station will also include a 2,000 m2 ‘European Academy of Culture’, a concept devised by the writer Olivier Guez, including a 1,600 m2 space to host events and concerts. There will be 5,500 m2 of co-working space, a nursery, new restaurants and a one-kilometre running track on the station roof. The transformation of the Gare du Nord will clearly change the visual landscape of the station but it will also change its sonic landscape. There are six main line railway stations in Paris, five of which sound very similar. 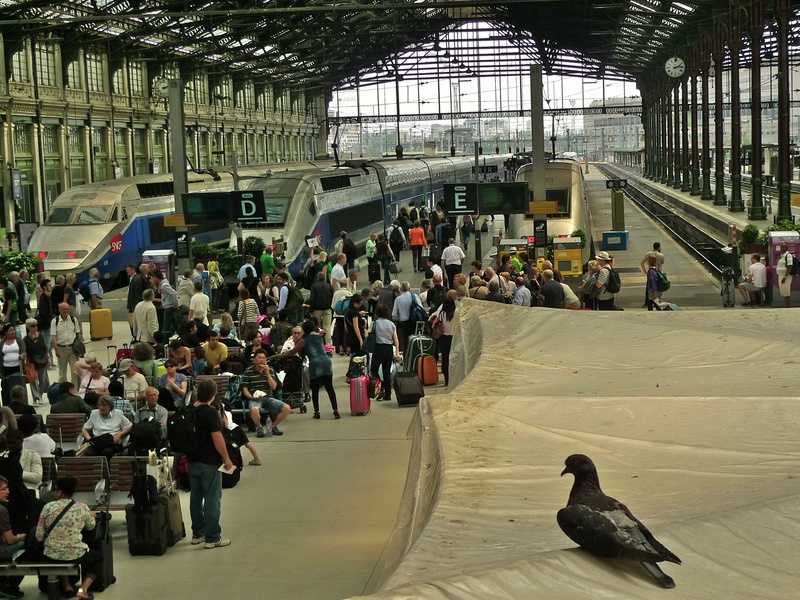 The exception is the current Gare du Nord, which has a very distinctive soundscape. The size of the main departures terminal together with Hittorff’s 19th century iron and glass construction and the cacophony of waiting passengers squeezed between the parked trains and the street outside gives the Gare du Nord a very particular sonic ambience. This is what the Gare du Nord sounded like in 2011. 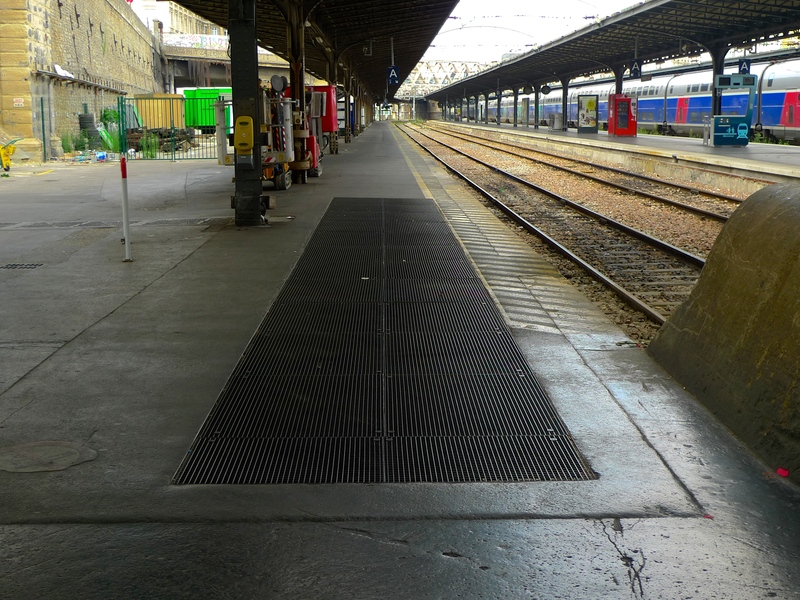 Although the major transformation project is not due to start until next year, some improvements to the Gare du Nord are already underway. When I went there last week I found men laying a new stone floor in the main departures hall, which gives us a clue as to how the soundscape of the station will change as the major construction work progresses. The sounds of the gasping trains will have to compete with the cacophony of building work for some considerable time to come. Having recorded the soundscape of the current Gare du Nord many times I shall continue to record and archive the sounds as the station’s transformation takes place. I shall be fascinated to discover the sounds of the new, ultra-modern Gare du Nord when all the work is completed. I will though still go back to my archive from time to time and listen to the sounds of the ‘old’ Gare du Nord; sounds that have been so familiar to me for almost the last twenty years and sounds that are about to disappear. 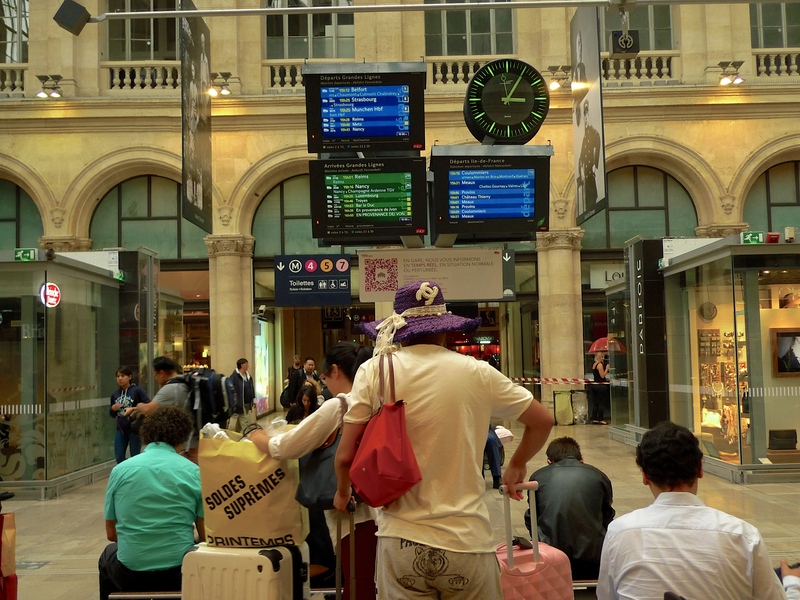 SOME TIME AGO I reported that the Gare du Nord, one of the six main line railway stations in Paris and the busiest railway station in Europe, is undergoing a transformation. But it’s not only the Gare du Nord that is being transformed. On the left bank of the Seine, in the southeastern part of the city, another Parisian main line station is having a major facelift. 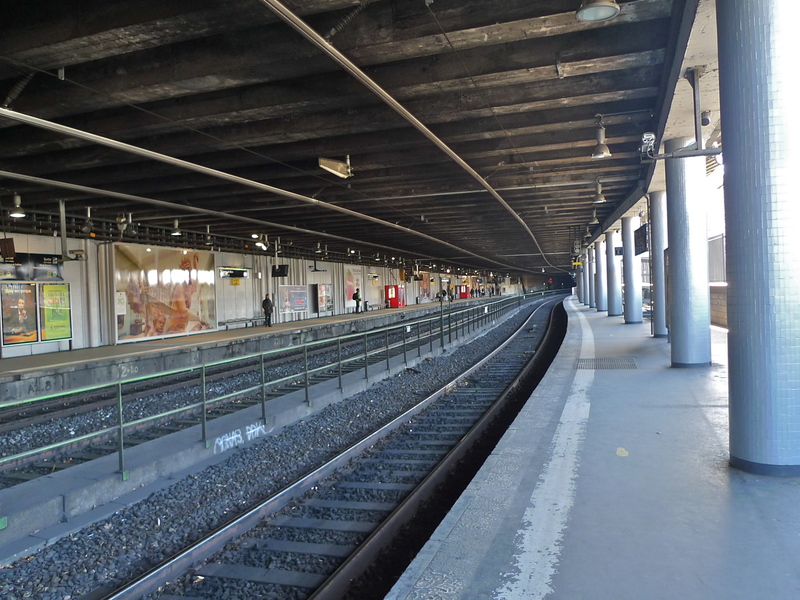 Since 2012, work has been underway at Gare de Paris Austerlitz, usually called Gare d’Austerlitz, to construct four new platforms, refurbish the existing tracks and rebuild the station interior. 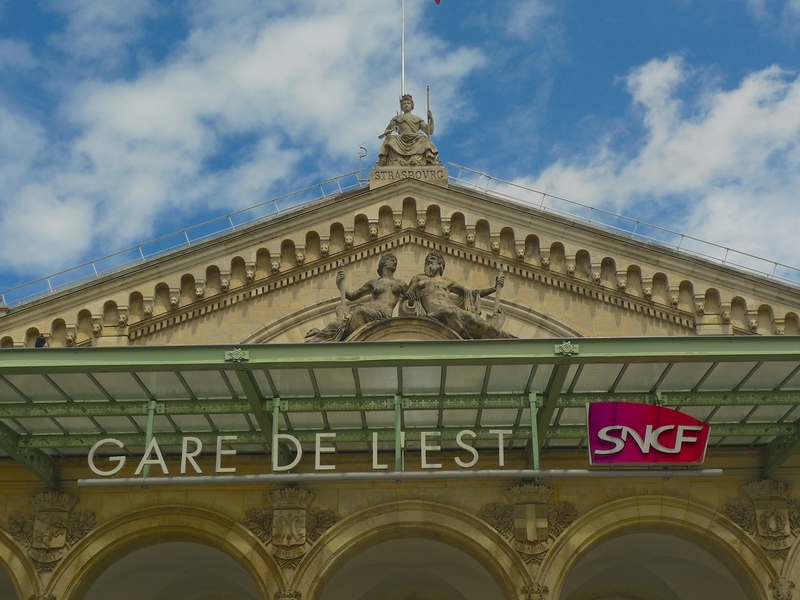 The renovation work will be completed by 2020 thus doubling the capacity of the station to accommodate some of the current TGV Sud-Est and TGV Atlantique services which will be transferred from Gare de Lyon and Gare Montparnasse, both of which are at maximum capacity. The redevelopment of Gare d’Austerlitz is not confined to the station itself. It will also include developing some 100,000 M² of land between the station and the neighbouring Hôpital Pitié-Salpêtrière to include housing, offices, public facilities and businesses. Built in 1840 to serve first the Paris-Corbeil then the Paris-Orleans line, the station, known originally as Gare d’Orléans, underwent its first makeover between 1862 and 1867 to a design by the French by architect Pierre-Louis Renaud, much of which is what we see today. The name, Gare d’Austerlitz was adopted to commemorate Napoléon’s victory at the Battle of Austerlitz in December 1805. Métro Line 5 arrived at Gare d’Austerlitz in 1906, the station survived the great flood of 1910 and in 1926 it became the first Parisian railway station to stop handling steam trains when electrification arrived. 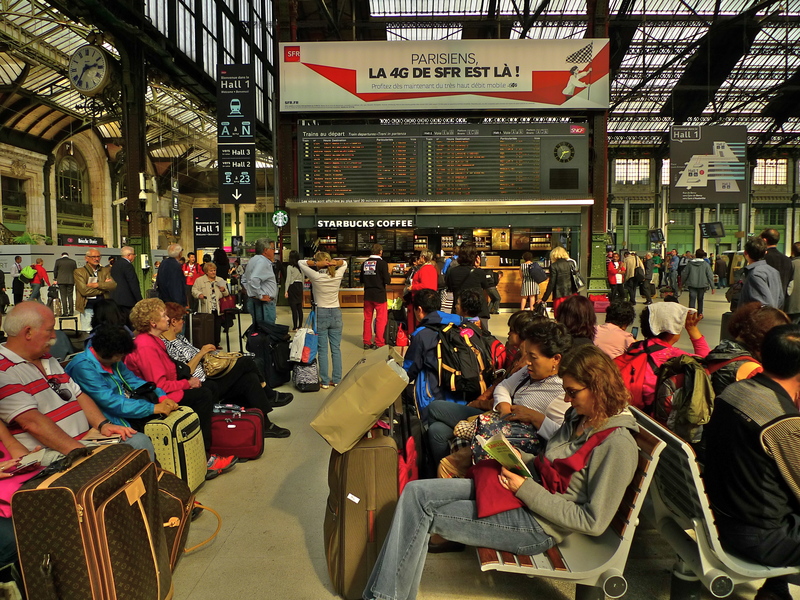 Although the smallest of the Parisian main line stations, until the late 1980s Gare d’Austerlitz was one of the busiest with services not only to Orléans but also to Bordeaux and Toulouse. 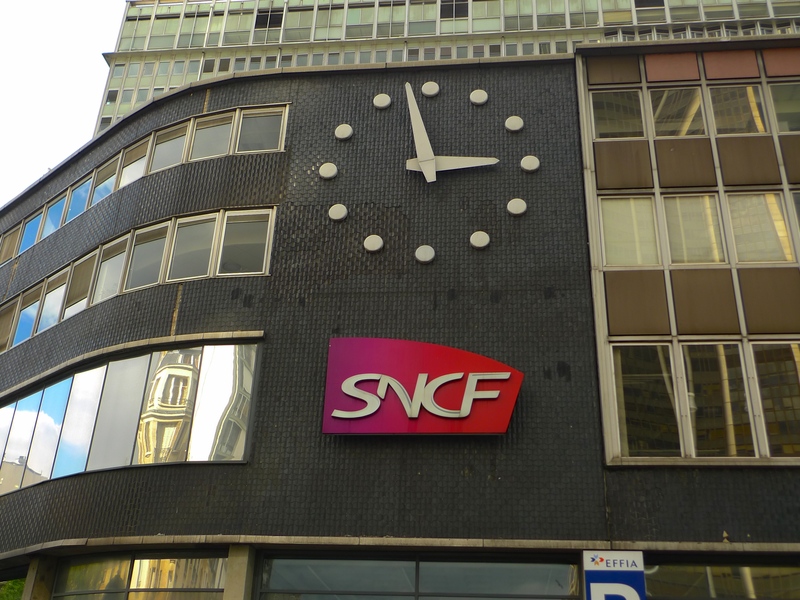 However, with the introduction of the TGV Atlantique using Gare Montparnasse, Gare d’Austerlitz lost most of its long-distance southwestern services and the station became a shadow of its former self. 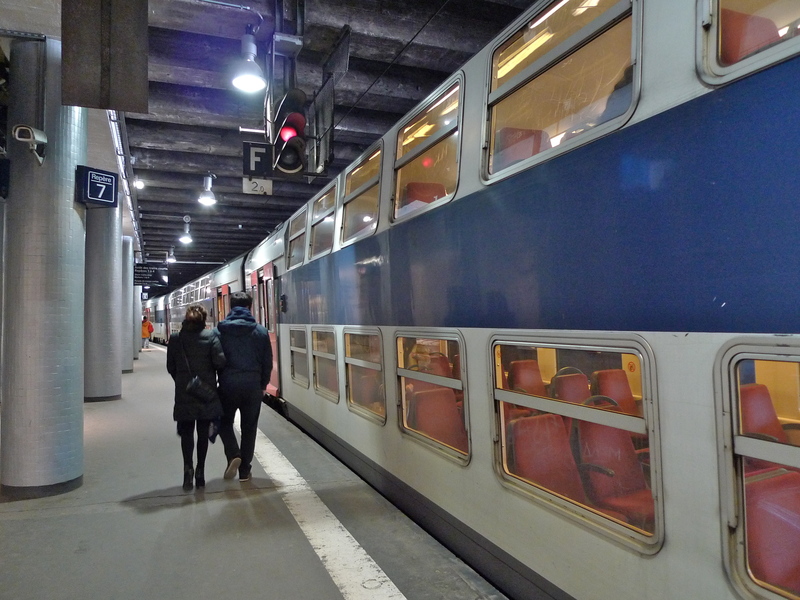 About 30 million passengers a year currently use Gare d’Austerlitz, about half as many as use Gare Montparnasse and a third as many as use the Gare du Nord. 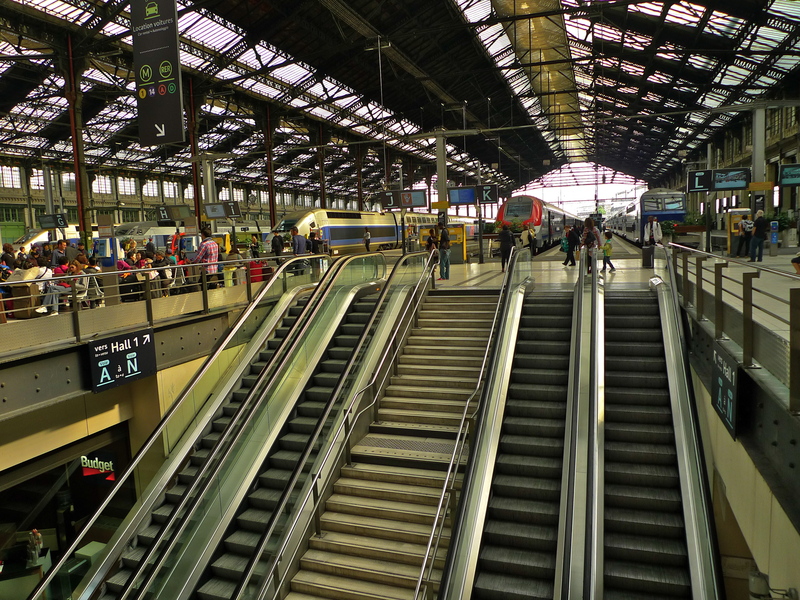 The 21st century makeover of Gare d’Austerlitz will see the station upgraded to handle TGV trains, some of its former southwestern services restored and its capacity doubled. Capturing the sounds of Paris is what I do and capturing changing soundscapes of the city has a special fascination for me. Any renovation of public spaces not only changes the visual aspect of the place but also its soundscape and so I am anxious to follow how the soundscape of the Gare d’Austerlitz will change as the current development unfolds. It will be interesting to compare these sounds with sounds recorded from the same place in 2020 when the work is completed. Of course, we don’t have to wait until 2020 to find a changing soundscape around Gare d’Austerlitz. We only have to go up from the main station platforms to the Métro station Gare d’Austerlitz to discover how soundscapes change over time. These are sounds I recorded on the Métro station platform in 2011 when the old, bone shaking, MF67 trains were running. And these are sounds I recorded this year from exactly the same place. The difference is that the old rolling stock has been replaced with the newer, more energy efficient, smoother running, much more comfortable, air-conditioned, MF01 trains. The old MF67 trains no longer ply Line 5 of the Paris Métro and their iconic sounds have gone forever. I believe that the everyday sounds that surround us are as much a part of our heritage as the magnificent buildings that grace this city and, although change is inevitable and often for the better, the sounds we lose in the process deserve to be preserved. Just as the sounds on Métro Line 5 have changed so will the sounds in and around Gare d’Austerlitz as its renovation unfolds. And I will be there to capture the changing soundscape for posterity. DESPITE ITS REPUTATION for being stuck in the past, the face of Paris is changing. A recognition that Paris needs to modernise to become more competitive in the twenty-first century, together with the Greater Paris Project, the plan to create a sustainable and creative metropolis by absorbing the suburbs and redeveloping the city centre, and the city’s bid to host the 2024 Olympic Games have become a catalyst for change. A huge amount of money is being invested in public transport with the extension of the tramway network, the extension and upgrading of the Métro system and the introduction of electric and biogas buses. Both the Ministry of Defence and the Palais de Justice are moving from the city centre into state-of-the-art new buildings on the outskirts of the capital to help stimulate the local economies, the Herzog & de Meuron designed skyscraper, the Tour Triangle, a 180 metre (590 ft) tall glass pyramid in the southwest of the city, has been given the green light and even the ghastly Tour Montparnasse is due for a makeover. 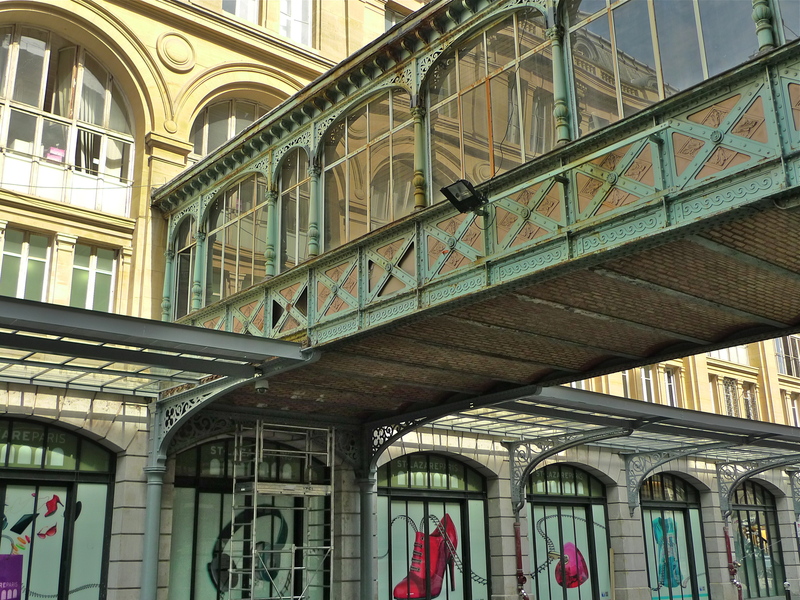 Although Paris is not yet a permanent building site, the pace of change is accelerating as seen by the recent announcement of a €600 million transformation of the busiest railway station in Europe, the Gare du Nord. The Gare du Nord is one of six main line railway stations in Paris and with some 2,100 trains carrying 700,000 passengers per day, the station is not only the busiest in Europe, it’s the third busiest in the world. Despite being rather scruffy and certainly in need of a revamp, the current Gare du Nord is special for me not because of the number of passengers who pass through it but because it is the only Parisian railway station with a distinctive soundscape. It is a perfect example of a place being defined by its sounds. 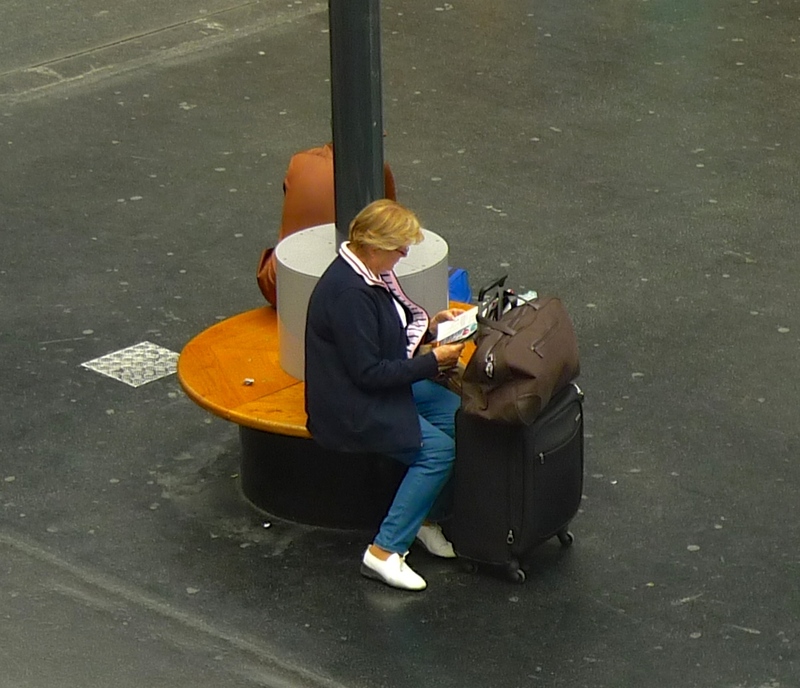 I went to the Gare du Nord the other day to capture more sounds for my archive before the station’s transformation changes the soundscape completely. 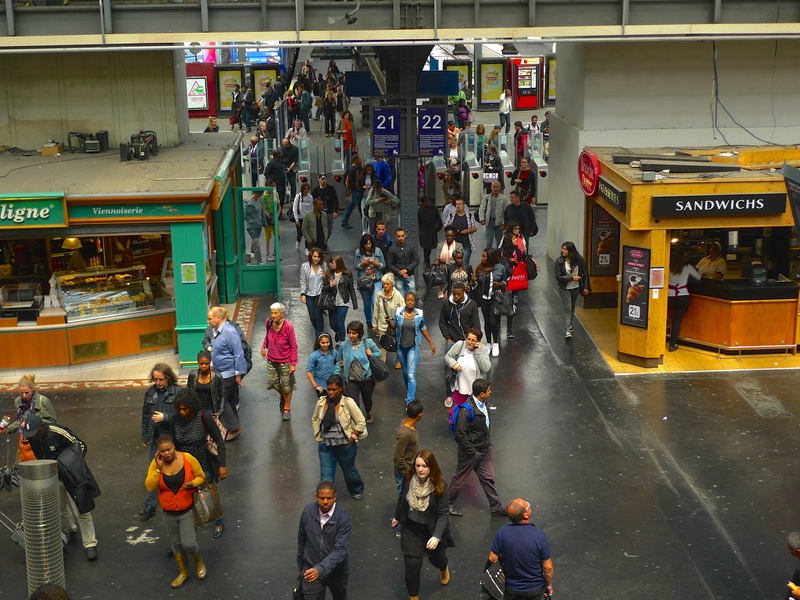 The transformation of the Gare du Nord will take place in two phases: the first has already begun and is due to be completed in 2019 and the second is scheduled from 2019 to 2023 – just in time for the 2024 Olympic Games – should the Paris bid be successful! The Gare du Nord currently links Paris to London, Brussels, Amsterdam, the northern suburbs and Charles de Gaulle airport as well providing RER and Métro lines that cross the city. 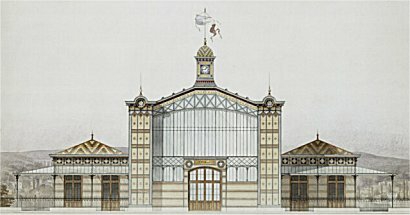 The plans, designed by the architects Wilmotte & Associés, call for a new arrivals terminal exiting in Rue de Dunkerque, the current main entrance where passengers enter and leave the station, a new departures terminal entered from Rue de Maubeuge, where the taxi rank currently is, a Pôle échange Francilien for trains to the suburbs, a Pôle échange National for main line SNCF trains and a new €80 million Eurostar Terminal for which work is already underway. A 160 metre-long, 60-metre wide walkway above the tracks will lead passengers to their platforms and the whole area around the station will be pedestrianised. As the visual landscape of the city changes so does its sound landscape and as an archivist of the contemporary Parisian soundscape I am striving to record and archive these changes. Of course, it doesn’t only require an architectural transformation to change the soundscape of the Gare du Nord. Over the last seventeen years, I’ve witnessed the sounds of breathless passengers carrying suitcases give way to the rumble of wheeled luggage bags and where once the sounds of the trains were complimented only by the train announcements, today it is the repetitive security announcements that dominate – an example of sounds not only reflecting a change of lifestyle but also a change to the very fabric of our society. Will I mourn the loss of the current distinctive soundscape of the Gare du Nord? Yes, of course, but I also look forward to the new, more passenger friendly terminus even with what I suspect will be its less distinctive soundscape. I will record the sounds of the Gare du Nord both during and after its transformation content in the knowledge that the distinctive sounds of the station that so many of us knew before the work began will be preserved in my archive for future generations to explore, to study and to enjoy. 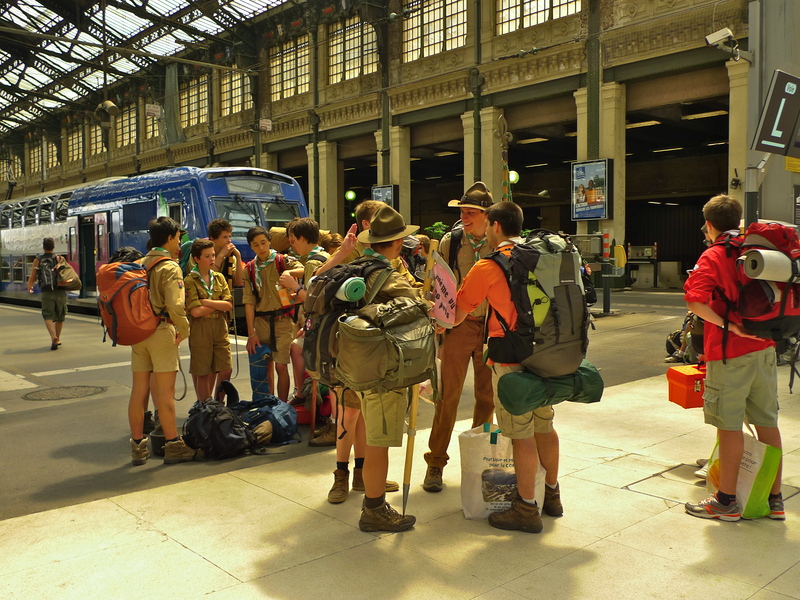 The Gare du Nord today – but not for much longer! A LITTLE PIECE OF history was made in the north east of Paris on Sunday, 13th December. At noon, without fanfare or ceremony, a train entered the newly completed Gare Rosa Parks for the first time. Named after the American civil rights activist, Rosa Parks, the Gare Rosa Parks is the first RER station to be built in the city since the Gare Bibliothèque François-Mitterrand in 2001. Gare Rosa Parks becomes the twenty-second station on RER Line ‘E’, part of the RER (Réseau Express Régional) regional rapid transit system serving Paris and its suburbs. The RER network comprises five lines of which two, Line ‘A’ and Line ‘B’, are operated by RATP (Régie Autonome des Transports Parisiens) and the other three, Lines ‘C’, ‘D’ and ‘E’, are operated by SNCF (Société nationale des chemins de fer français), the state-owned railway company. As the display inside the newly opened station shows, Gare Rosa Parks is not the first station on this site. It was previously home to Gare Est-Ceinture, one of the stations of the Chemin de fer de Petite Ceinture (the ‘little belt railway’) that, from 1852, was a circular connection between the Paris main railway stations within the fortified walls of the city. The Petite Ceinture was closed in 1934 and Gare Est-Ceinture, like many of the stations on the line, was demolished. It took two hundred companies and almost five years of construction work to complete Gare Rosa Parks and several major challenges had to be confronted along the way. To construct the 1,300 M2 station and its 25 metre long and 15 metre wide central quay, it was necessary to modify and rebuild 1.5 km of railway tracks. Around one thousand trains a day pass through the construction site so every detail of the work had to be planned some three years in advance to avoid disruption. During the station’s construction some 150,000 M3 of material had to be excavated and more than 25,000 M3 of reinforced concrete had to be laid but the most impressive part of the operation was the creation of a passageway connecting the north and south of the area under the nine rail tracks above. For six days, a huge prefabricated concrete parallelogram, 40 metres long and weighing 4,000 tonnes, was pushed into place by high-powered hydraulic cylinders while tons of earth were excavated. 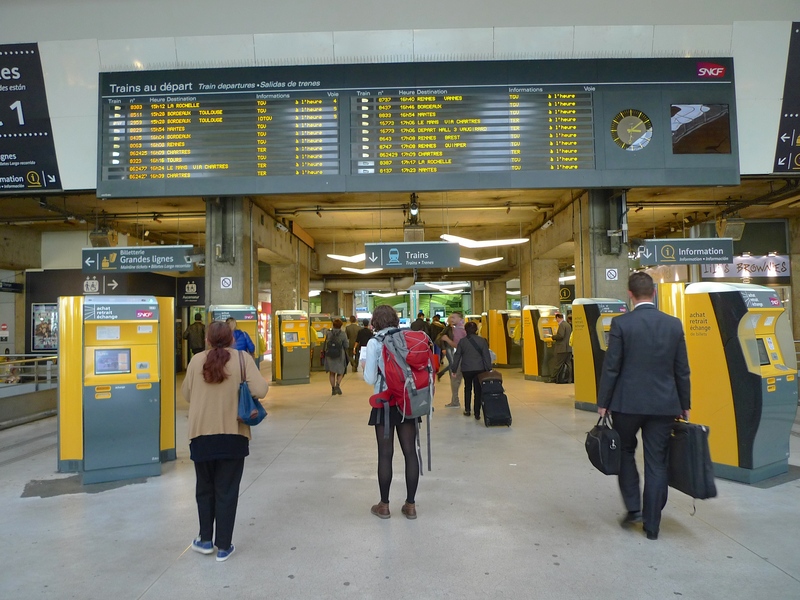 The total bill for the station came to 130 million Euros, which was shared by the Île-de France regional authority (51.2%), the City of Paris (25.7%), the State (22.7%) and SNCF (0.4%). As you can hear, although the construction work is now completed and the station is open for business, there is still some cosmetic work going on. On the day I was there, a man with a stonecutter was working in the reinforced concrete passageway and the sounds permeated periodically through the entire station. The station, designed by the architects Jean-Marie Duthilleul and François Bonnefille, has been constructed with environmental protection in mind. A series of photovoltaic cells installed on the 135 metres of platform shelters supply electric power for the exterior lighting. A specially designed roof on the central building heightens its thermal insulation capacity and a storm water recovery system installed on the roof provides water used for cleaning and for flushing the station’s toilets. During the construction phase a carbon audit was carried out to measure the emissions of greenhouse gases generated by the site, as well as the greenhouse gas emissions commissioning the station will help to avoid (through the shift from road traffic to rail transport). The conclusion was that by 2032, CO2 emissions from the construction site will have been compensated for and by 2066 some 80,000 tonnes of CO2 equivalent will have been avoided. 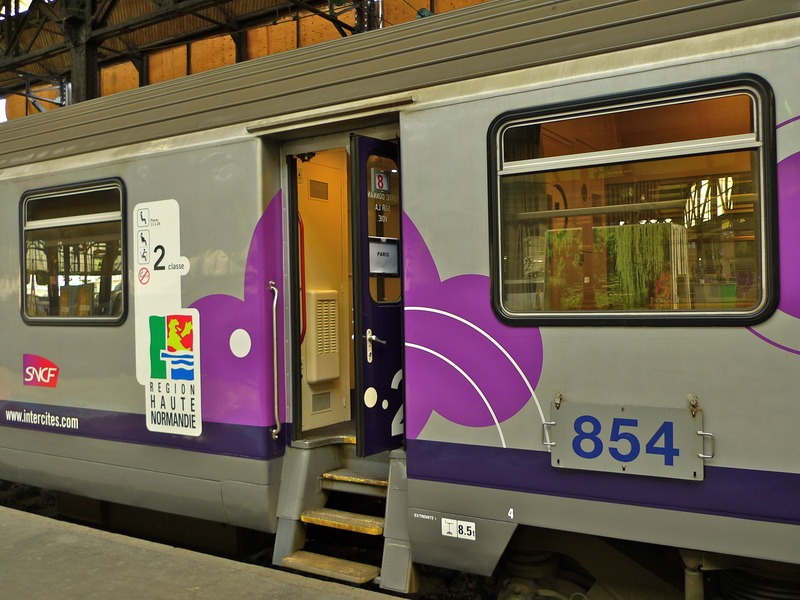 To reduce the waiting time, five trains have been added to the RER Line ‘E’ fleet so trains will run every six minutes and every four minutes at peak times. 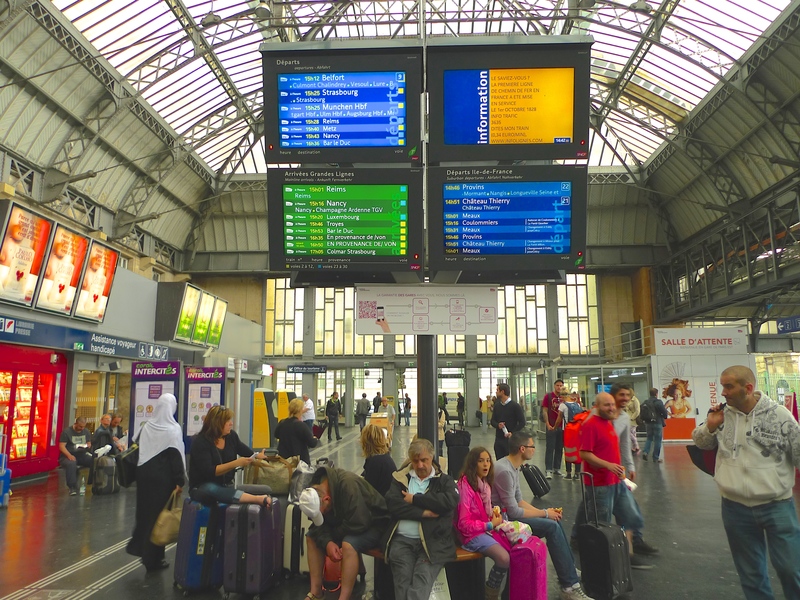 Approximately 50,000 travellers a day are expected to use Gare Rosa Parks but this will rise to around 85,000 in 2020 when RER Line ‘E’ will be extended westward to Mantes-la-Jolie. This extension will include the construction of an eight-kilometre tunnel between the current western terminus Haussmann – St-Lazare and La Défense from where Line ‘E’ will take over the part of RER Line ‘A’ to Nanterre, Sartrouville and Poissy and then a section of the SNCF tracks to reach Mantes-la-Jolie. The extension is expected to open in 2018 and be fully operational in 2020. In an example of joined-up thinking, Gare Rosa Parks has connections to other forms of public transport: Tram Line 3b, the N° 54, 60 and 239 buses and Vélib and Véligo bicycle stations. Studies are also being carried out to look at the possibility of extending the recently opened Tram Line T8 to Gare Rosa Parks. Gare Rosa Parks is situated in the nineteenth arrondissement close to Porte d’Aubervilliers, an area that for a long time has been run down and underserved by rail transport. Now the area is being redeveloped and with an influx of people expected over the coming years, Gare Rosa Parks is a welcome addition to the local public transport network. IMAGINE THE SCENE: It’s 22nd October 1895 and the Granville to Paris express, operated by the Compagnie des chemins de fer de l’Ouest, is approaching Paris. Steam locomotive No. 721, hauling three baggage vans, a post van and six passenger carriages with 131 people on board, left Granville on time at 8:45 am but it is now several minutes late for its 15:55 scheduled arrival at the Paris Montparnasse terminus. Trying to make up lost time the driver, Guillaume-Marie Pellerin, a 19-year veteran of the company, makes the decision to approach Montparnasse station at cruising speed – some 50 kilometres per hour (31 mph). Realising that the train is entering the station too fast, Pellerin applies the locomotive’s Westinghouse air brake – but it fails to operate. One of the guards, Albert Mariette, is preoccupied with filling out paperwork as they enter the station and fails to notice in time that train is going faster than it should be. Just as he applies the emergency hand brake the train smashes through the buffer stop. 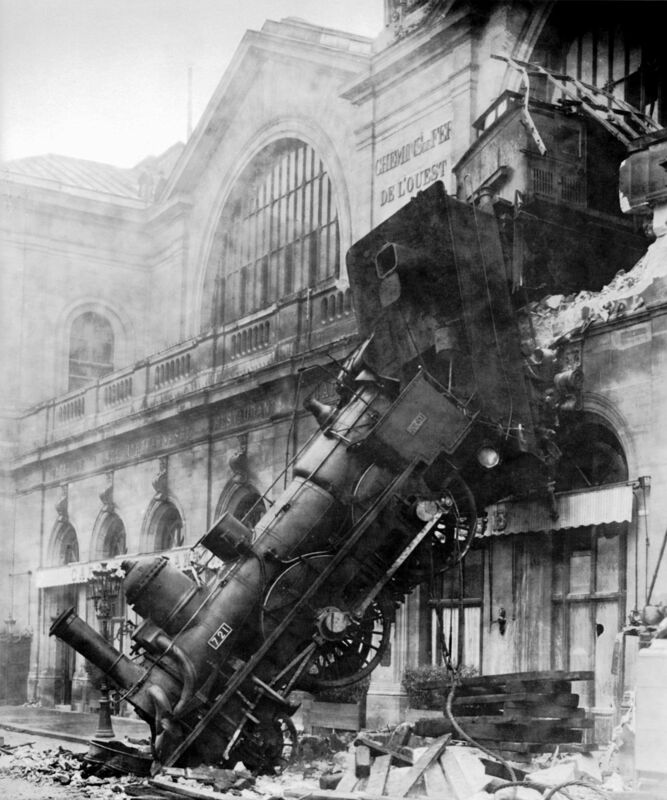 Amid the deafening noise and with steam belching from the engine and sparks flying, people scatter as the engine clatters across almost 30 metres of the station concourse, crashes through a 60-centimetre thick wall, shoots across a terrace and smashes out of the station, plummeting onto the Place de Rennes 10 metres below where it ends up on its nose. Remarkably, there is only one fatality. Marie-Augustine Aguilard, has been standing in for her husband, a newspaper vendor, while he goes to collect the evening papers. She is hit and killed by falling masonry. Two passengers, the fireman, two guards and a passerby in the street sustain injuries. In the aftermath, the passenger carriages are undamaged and removed easily and within forty-eight hours work has begun to remove the locomotive and the tender. An attempt is made to move the locomotive with fourteen horses but this fails so a 250 tonne winch is brought to the scene and with 10 men hauling the winch the locomotive is lowered to the ground and the tender lifted the back in to the station. 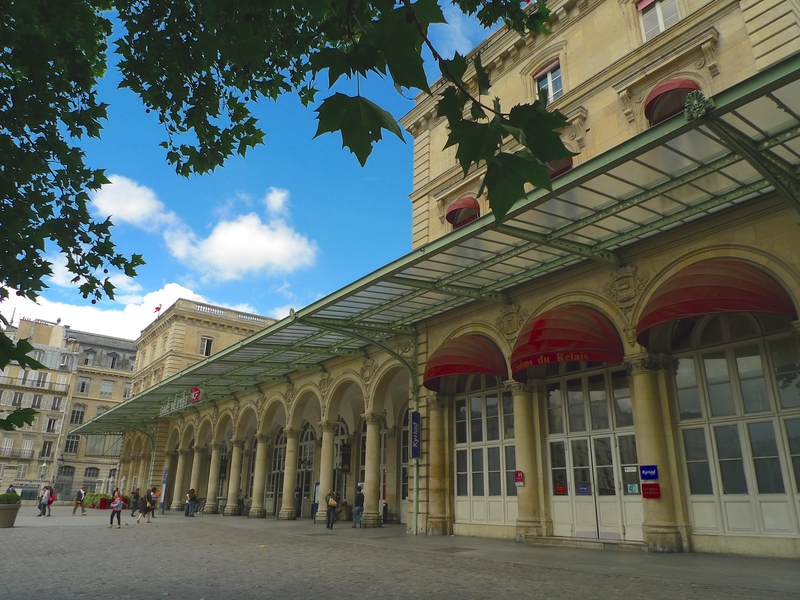 The station the Granville to Paris express slammed through was built by architect Victor Lenoir and the engineer Eugène Flachat in 1852, replacing the original 1840 Gare de l’Ouest station, which was unable to cope with the mid 19th century growth in traffic. In 1909 the state bought the Compagnie des chemins de fer de l’Ouest including the Gare Montparnasse, which it used for new lines to Tours, Nantes, Bordeaux and La Rochelle. In the 1930s a separate extension was added to the station, the Gare du Maine, designed by the French architect and designer Henri Pacon in Art Deco style. Eventually, this extension became the terminus for the main lines and the old station was reserved for commuter traffic. Site of the original Gare du Maine extension which was demolished in the 1960s. 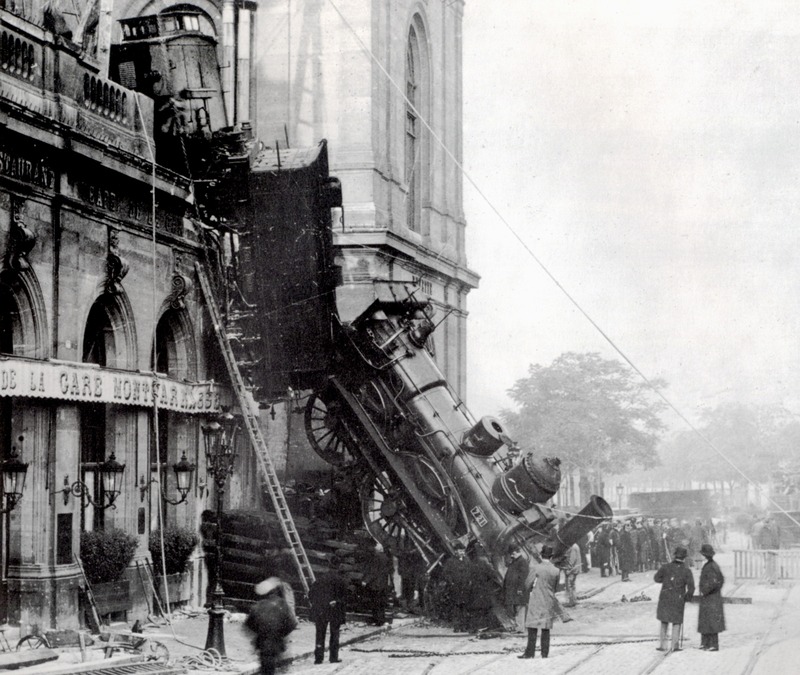 Both the 1852 Gare Montparnasse and the Place de Rennes into which the express nose-dived are no more. In 1951, Place de Rennes was renamed Place du 18 juin 1940 in commemoration of the radio broadcast Charles de Gaulle made from London on 18th June 1940 (L’Appel du 18 juin), in which he urged the French people to resist the Nazi occupiers (who had invaded the previous month), thereby launching the French Resistance Movement. 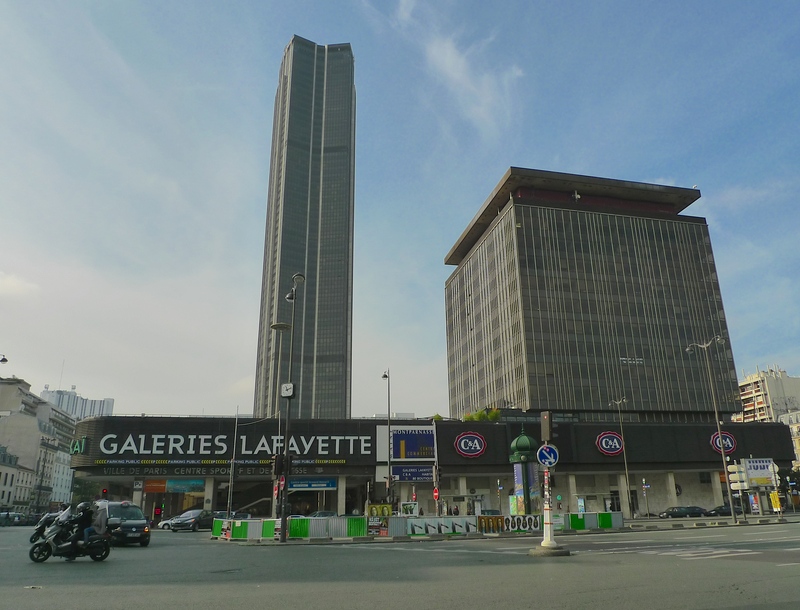 During the 1960s, a new Gare Montparnasse, integrated into a complex of office buildings, was built and in 1969, the old station was torn down and the Tour Montparnasse was built in its place. 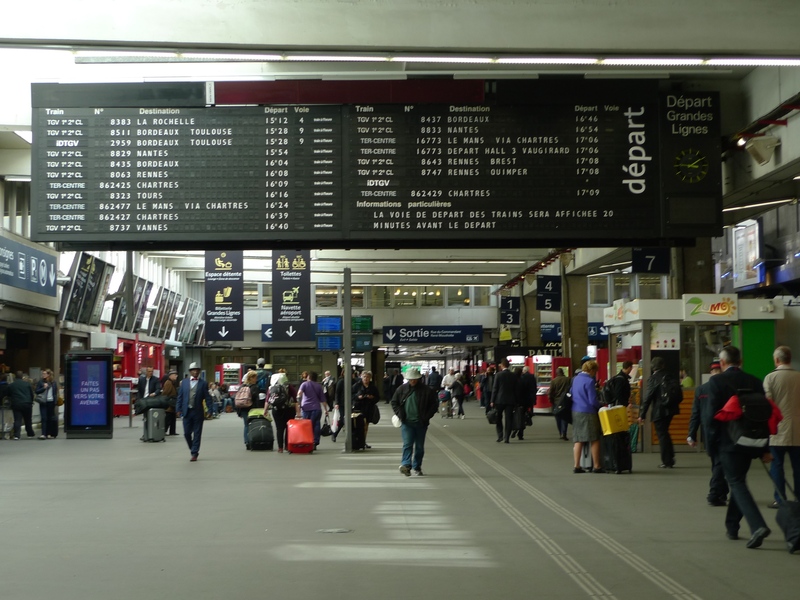 Over 50 million passengers a year pass through today’s Gare Montparnasse, one of the six mainline railway stations in Paris. 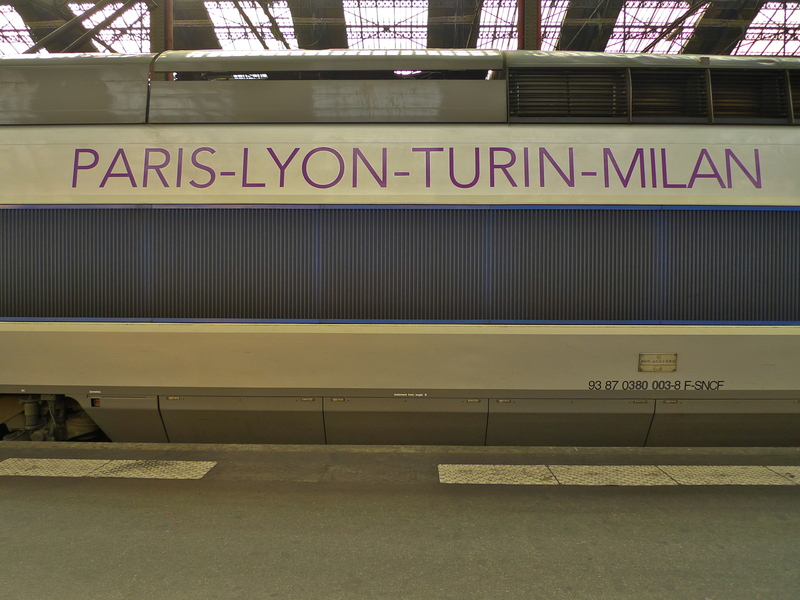 They use intercity TGV trains to the west and south-west of France including Tours, Bordeaux, Toulouse, Rennes and Nantes, and suburban and regional services on the Transilien Paris – Montparnasse routes. 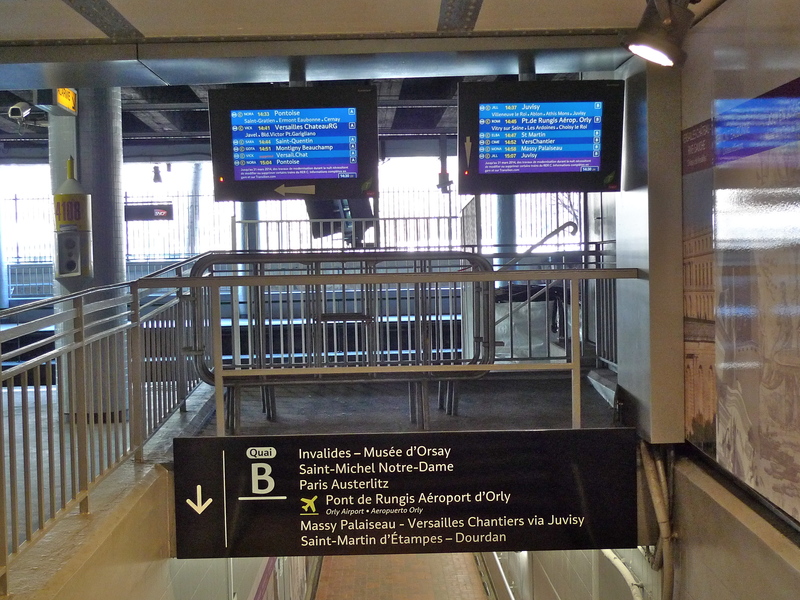 They also use the busy Métro station, an intersection for Métro lines 4, 6, 12 and 13. I went to the Gare Montparnasse the other day to capture the sounds inside the station. My soundwalk took me from the main entrance, up an escalator to Hall 1 and then to the intercity platforms in time to capture the sounds of the 15:28 departure to Bordeaux and Toulouse. I was surprised to find that amid the hustle and bustle of the main concourse and the platforms there were places that were relatively calm and quiet. Closer to the platforms of course it was the trains that made their voices heard. Sounds stimulate the imagination so, if like me, you have a fascination for sound and a sense of history, you might be forgiven for imagining that the sound of the gasps of compressed air escaping from the parked trains are not too far removed from the sound of steam escaping from the Granville to Paris express hurtling towards its resting place in the Place de Rennes. The fate of the Granville to Paris express was well documented in pictures. As well as the iconic photographs by Studio Lévey and Sons and Henri Roger-Viollet (above), a third equally well-known photograph of the scene by L. Mercier is displayed in the Musée d’Orsay. But nowhere was the event or its aftermath captured in sound – a good example of just how recent our ability to capture topical sounds is and a perfect example of how much of our sonic history has passed by completely unrecorded. I’m pleased to say that while I was in the Gare Montparnasse all the trains stayed very firmly on their tracks with none of them attempting to cross the concourse and venture outside! EARLIER THIS WEEK I had to travel from Paris to Amsterdam. After years of criss-crossing Europe courtesy of Air France, I’ve come to realise that being seduced into thinking that a one-hour flight might be the quickest and most convenient way to travel between these two cities is a myth perpetuated only by the prospect of accumulating more, usually unclaimed, air miles. Now, I’m more than happy to avoid the endless angst associated with airports and opt for a much more civilised mode of travel – the train. After walking to the bus stop at the end of my little street I caught the 43 bus, which took me to the Gare du Nord in time for me to catch my 10.25 Thalys train to Amsterdam Centraal Station. 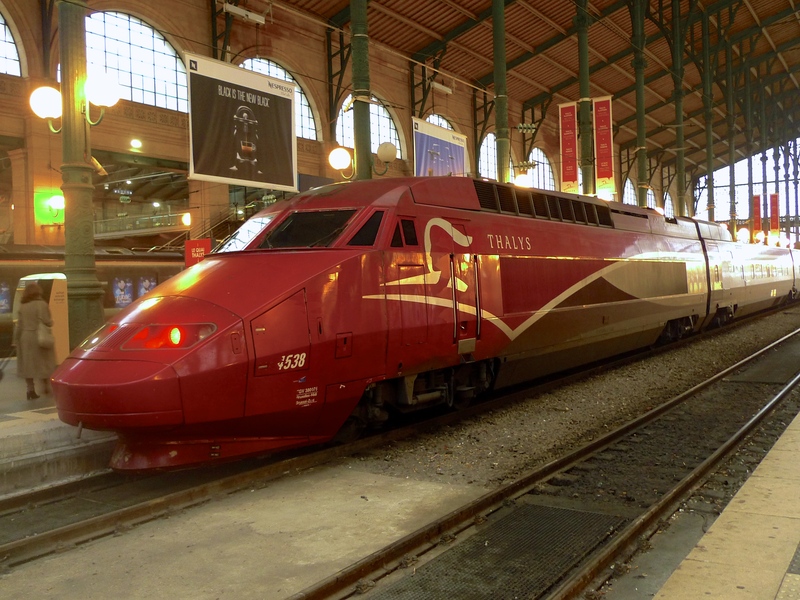 Thalys is an international high-speed train operator originally operating on the LGV Nord high-speed line between Paris and Brussels, a line shared with Eurostar trains going from Paris or Brussels to London via Lille and the Channel Tunnel. 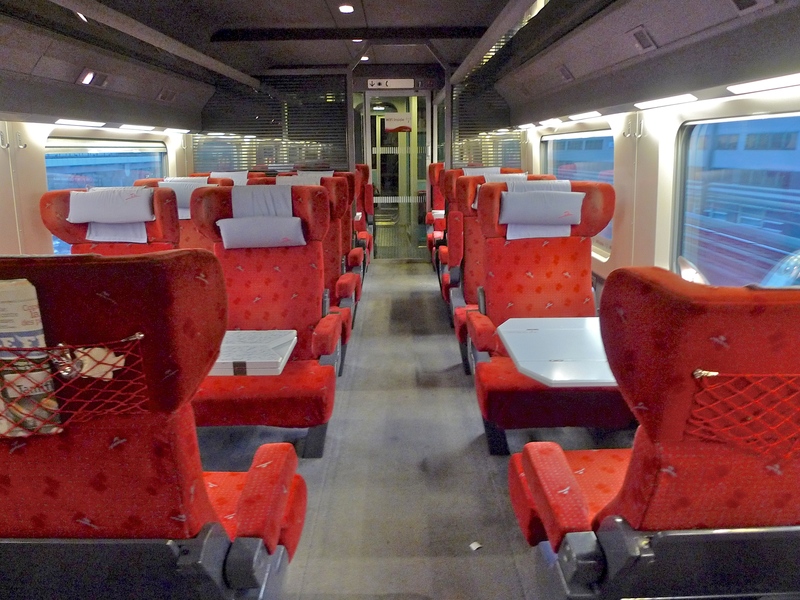 The line is also shared with French domestic TGV trains. 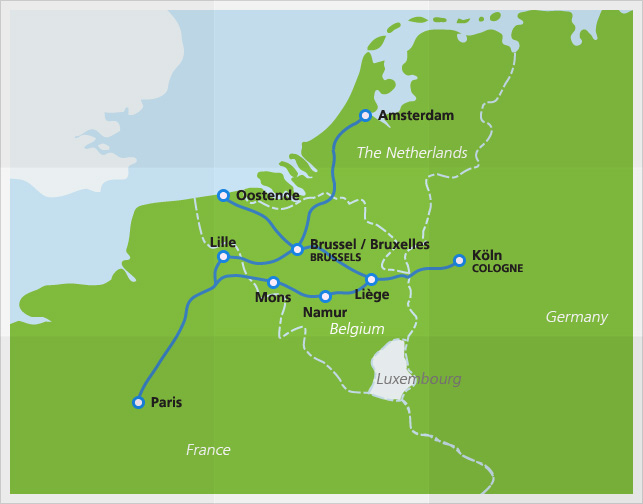 Beyond Brussels, the main cities Thalys trains reach are Antwerp, Rotterdam, Amsterdam, Liège, Bruges, Ghent, Charleroi, Aachen and Cologne. En route to Amsterdam the Thalys crosses France, Belgium and The Netherlands stopping at Brussels (Bruxelles in French), Antwerp (Anvers in French), Rotterdam and Schiphol, before arriving at Amsterdam Centraal Station three hours and seventeen minutes after leaving Paris. Thanks to a very sensible piece of joined-up thinking, Schiphol railway station is directly under Schiphol airport so for anyone flying from Schiphol, a short escalator ride from the train platform will deposit you directly inside the airline departures area. Just as with the airlines, train ticketing remains a complete mystery to most of us but since I had the luxury of being able to book my tickets several weeks in advance, I was able to travel in Comfort Class 1 for less than the price of an Economy Class ticket bought close to the day of departure. Since I never travel anywhere without microphones and a sound recorder I couldn’t resist recording my departure from Paris. I began recording as I was walking along Platform 9 at the Gare du Nord towards my carriage, N°13. A very smart young man in a Thalys uniform clipped my ticket and I boarded the train. I am fascinated by what I call ‘transitional sounds’, the changing sounds we experience as we move from one environment to another. In this case, the sounds of the busy station platform merging into the relative silence of the train carriage. It doesn’t take long though before this relative silence is penetrated by a different range of sounds – people stowing their luggage and settling into their seats, the rustle of papers, snatches of conversation, a lady progressing along the carriage offering to book taxis for those alighting at Brussels (a perk of travelling business class) and the loudspeaker announcements. 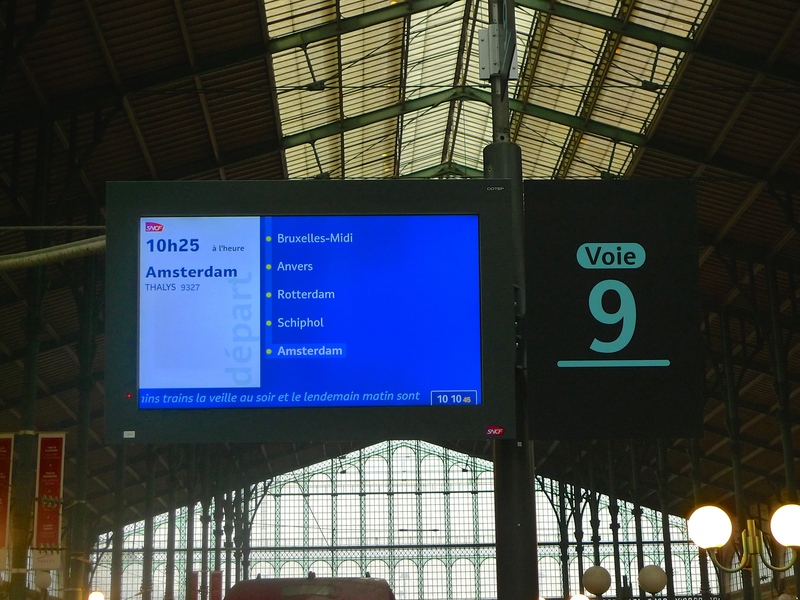 On Thalys trains, the announcements are made in four languages, French, Dutch, German and English and since my journey started in Paris protocol dictates that the announcements begin in French. On the return journey from Amsterdam they begin with the Dutch version. The lady announcer, who speaks all four languages, tells us that departure is imminent, the doors close and almost imperceptibly the train moves off. It’s not until we’re well clear of the station that the sound of the wheels rattling over rails is heard. 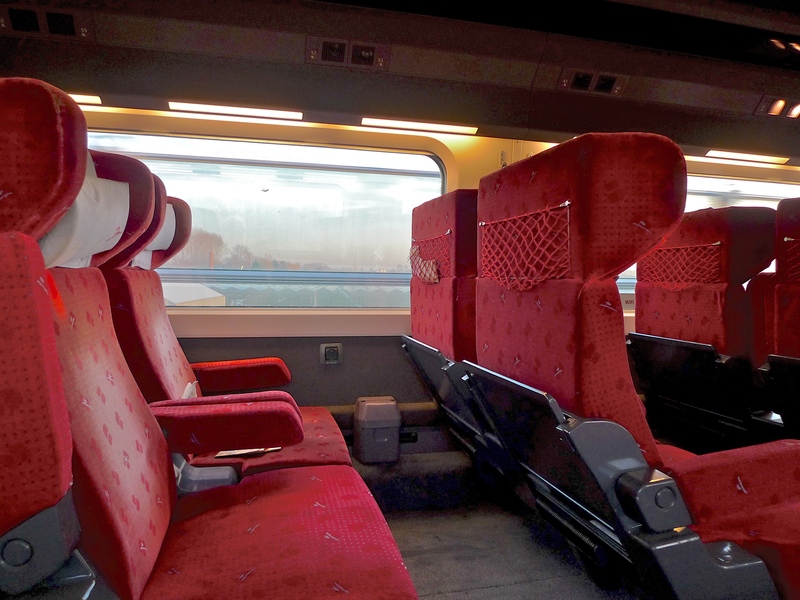 I continued recording until we passed Saint-Denis in the northeast of Paris and began picking up speed by which time I’d learned from the announcer that I was on the right train, the Thalys bar was open in the adjacent carriage and that I should keep my ticket with me at all times. Presently, Charles de Gaulle airport hove into view in the distance and I couldn’t resist raising a glass to all the passengers there mired in the endless check-in queues, complex security procedures and all the other irritations associated with air travel. As one who used to make 150+ flights every year I’m quite content now to leave all that behind and let the train take the strain. THE GARE DE L’EST is one of the six mainline railway stations in Paris. Designed by the French architect, François Duquesnay, it was opened in 1849 by the Compagnie du Chemin de Fer de Paris à Strasbourg, the Paris-Strasbourg Railway Company. In 1854, the service was expanded and the Gare de l’Est also became the western terminus of the Paris – Mulhouse Railway. October 4th, 1883, was a key date for the Gare de l’Est because that was the day that saw the first departure of the original Express d’Orient from the Gare de l’Est bound for Istanbul. 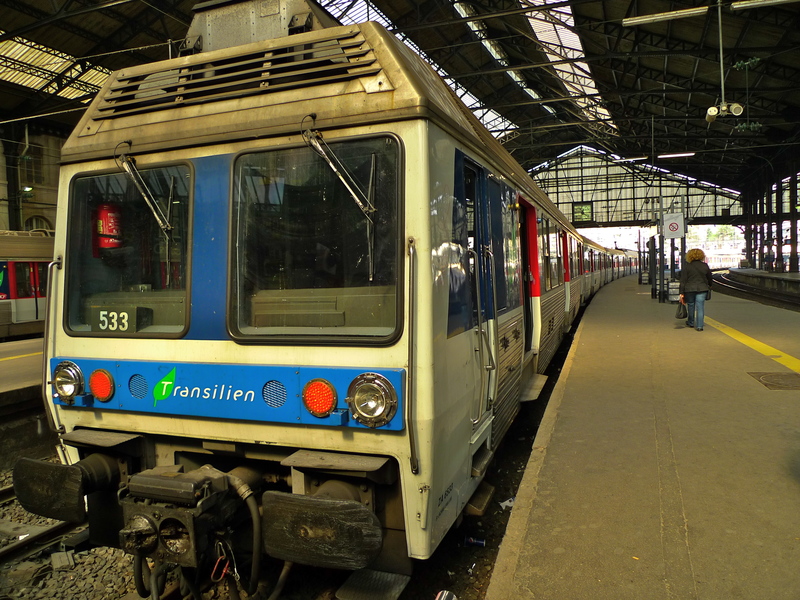 Run by the Compagnie Internationale des Wagons-Lits, the original route was from Paris, Gare de l’Est, to Giurgiu in Romania via Munich and Vienna. At Giurgiu, passengers were ferried across the Danube to Ruse, Bulgaria, to pick up another train to Varna. They then completed their journey to Istanbul (then called Constantinople) by ferry. 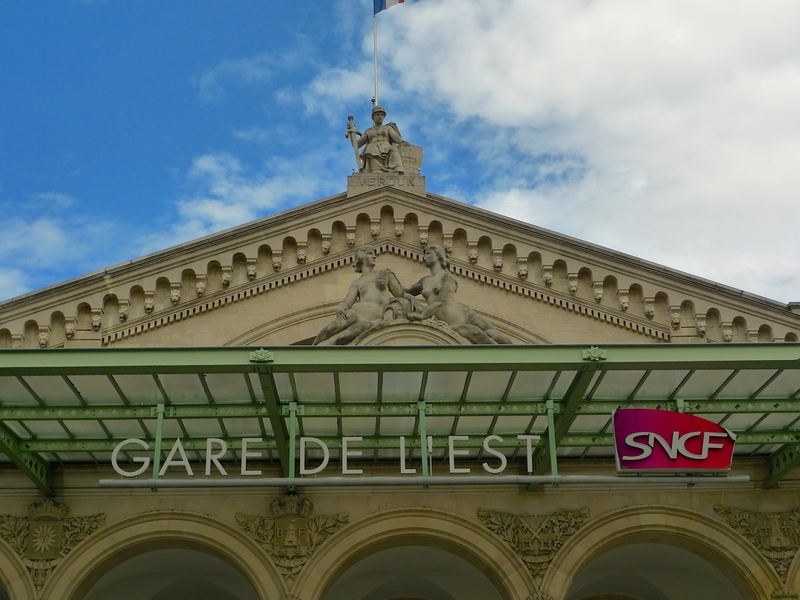 It wasn’t until six years later, on June 1st, 1889, that the first non-stop train left the Gare de l’Est for Istanbul. The Gare de l’Est was renovated in 1885 and again in 1900 and then in 1931 it was doubled in size with a new extension built symmetrically with the old station. At the top of the west façade of the original part of the Gare de l’Est is a statue by the sculptor Philippe Joseph Henri Lemaire, representing the city of Strasbourg. At the east end of the station, the newer part, is a statue personifying Verdun, by Varenne. 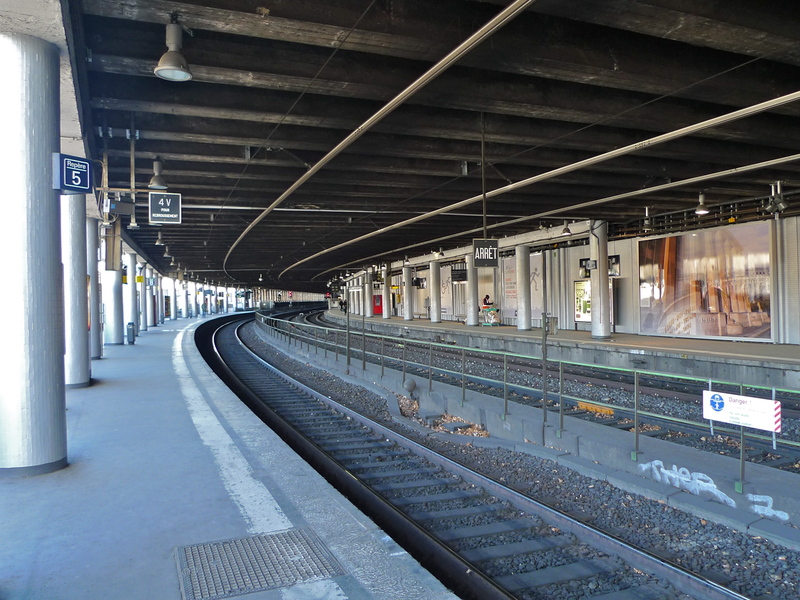 Both Strasbourg and Verdun are important destinations served by Gare de l’Est but Verdun in particular reminds us the role the Gare de l’Est played in 1914 at the outbreak of the First World War. The railway network from the Gare de l’Est stretches towards the east of France and it was from this station that thousands of French troops, the poilus, were despatched to the Western Front in 1914. 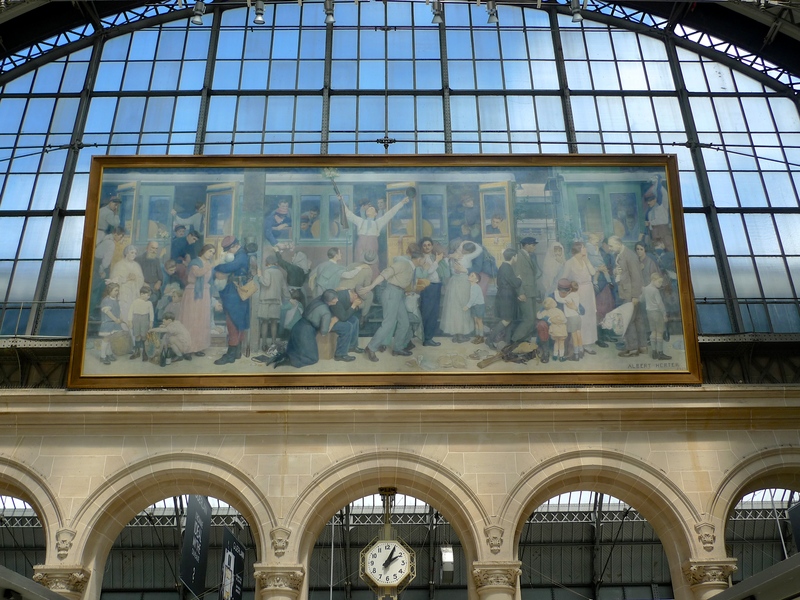 We can get an impression of the contemporary scene from a painting that hangs in the western concourse of the Gare de l’Est by the American painter, Albert Herter. Herter painted this in memory of his son, a volunteer in the French army, who was killed at Bois-Bellau in the last few month of the war. The painting includes the artist himself, on the right holding a bouquet in his hand, while his wife is on the far left with her hands clasped together. These two figures draw our eye towards the centre of the painting and their son, standing in the doorway of the carriage with a flower in his gun and his cap held high. His enthusiasm is in stark contrast to the tears of the women on the platform. The painting was given to the Compagnie des Chemins de Fer de l’Est by the painter as a gift in 1926. 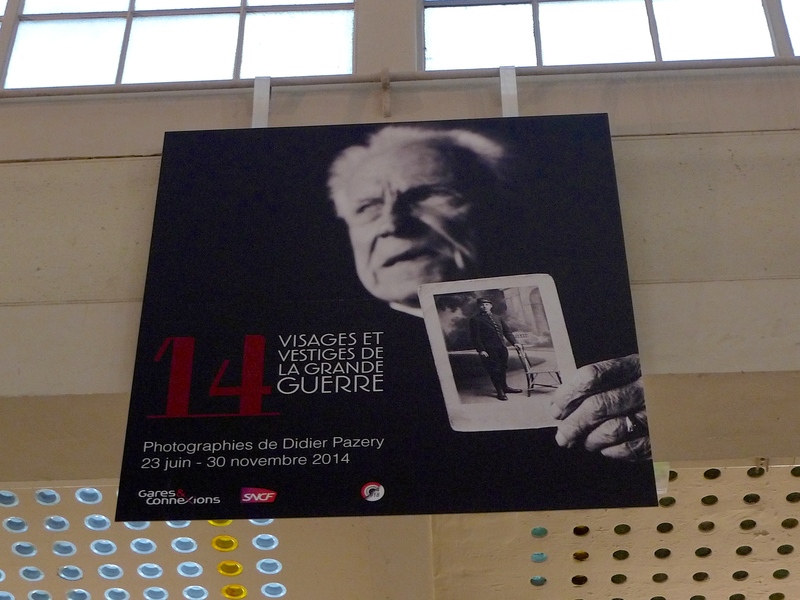 In this centenary year of the outbreak of the First World War, the Gare de l’Est is hosting a photographic exhibition, Visgaes et Vestiges de la Grande Guerre, by the photographer Didier Pazery. 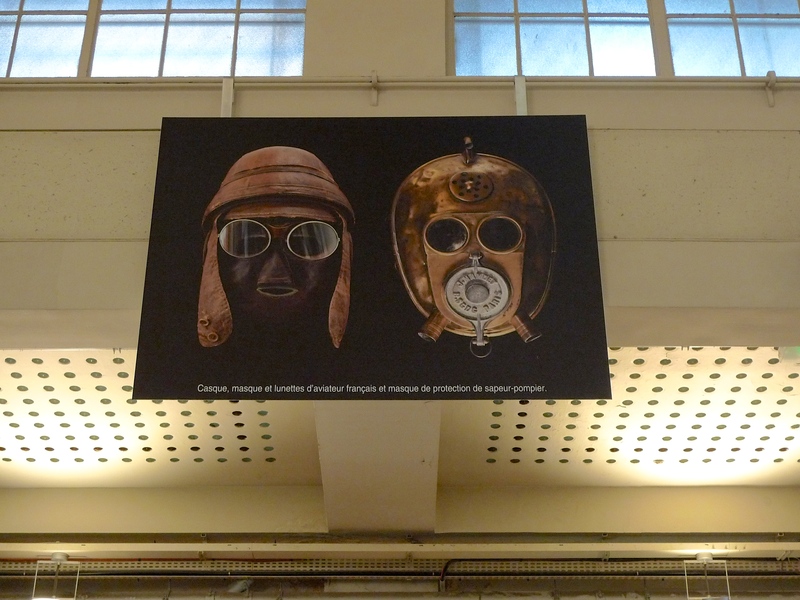 From the exhibition, Visgaes et Vestiges de la Grande Guerre, by Didier Pazery. After the death in 2008 of Lazare Ponticelli, the last of the Poilus, Didier Pazery made pictures of the old front line and of artefacts belonging to the Meaux Great War Museum. The exhibition includes some of these pictures together with portraits made ​​between 1996 and 2007 of the last survivors of the conflict. 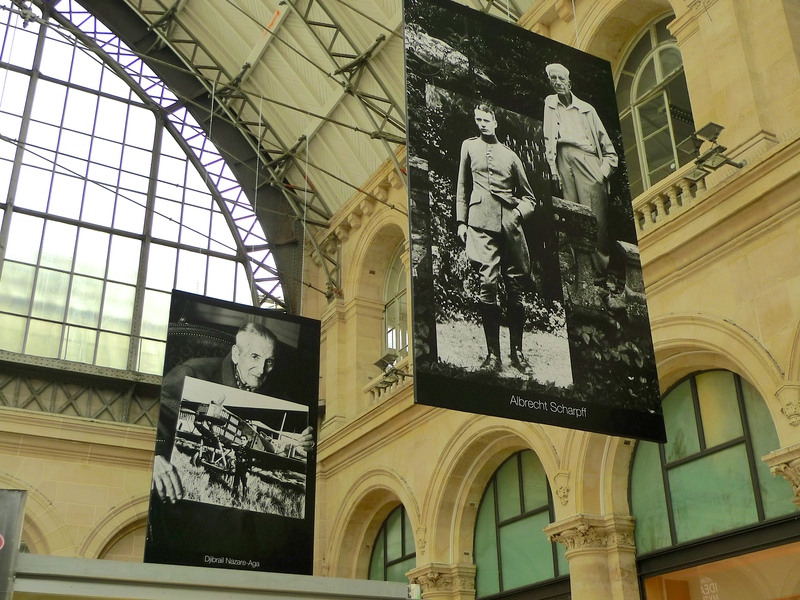 Before moving on to the sounds of the Gare de l’Est, there is one other feature of the station that has a connection with war, this time with the Second World War. This innocuous looking ventilation shaft on one of the platforms of the station hides something that the thousands of passengers who pass through this station each day are probably completely unaware of. There are a series of bunkers under this platform. 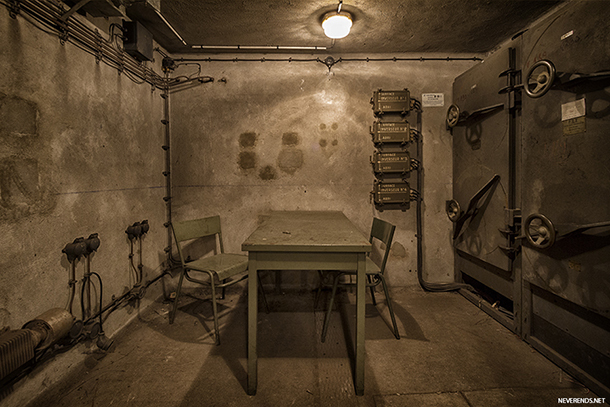 Built just before the outbreak of war and with space to accommodate seventy people, they were intended for use as bomb shelters, to protect against gas attacks and as a communications centre. They are all still intact but not open to the public. 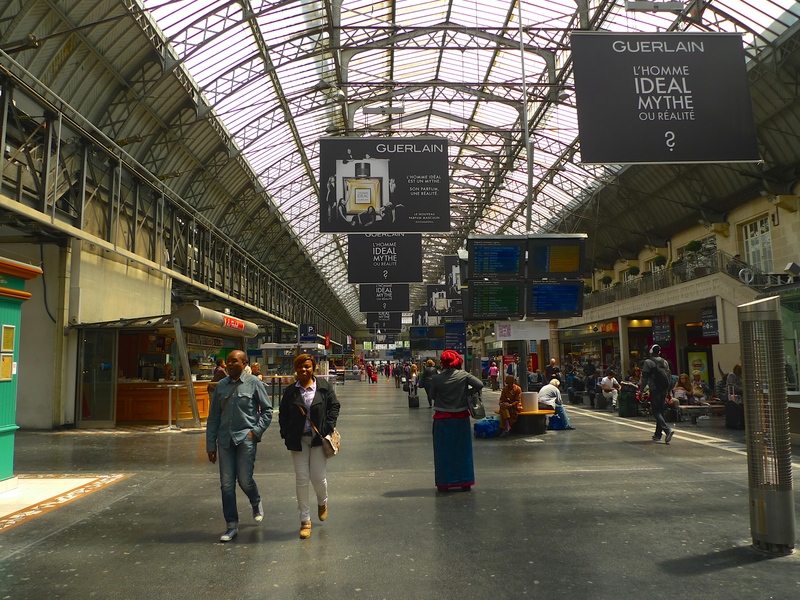 On my visit to the Gare de l’Est I was very much aware of its history, the Orient Express, the poilus and the bunkers, but I wanted to explore the station as it is today and particularly its contemporary sounds. 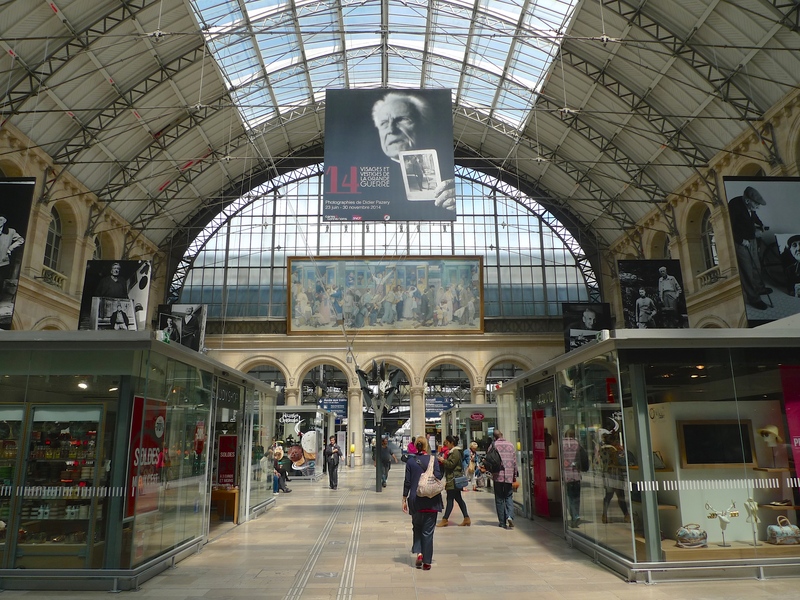 The Gare de l’Est is a big station and its glass roof is listed as a monument historique. 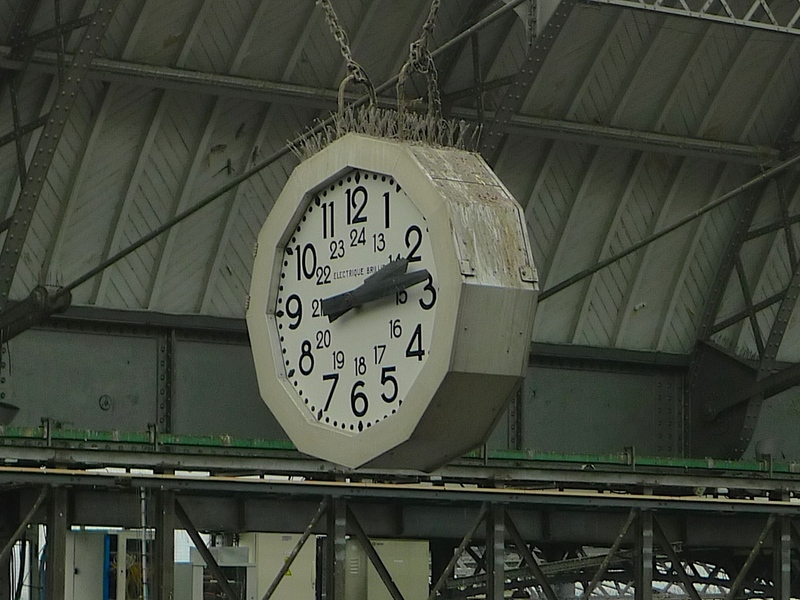 I don’t know whether its clocks share that distinction but, if not, perhaps they should. The movement of people within the station seems to pass in waves as trains arrive and depart. And in between train arrivals and departures people do what they always do, they sit and wait. 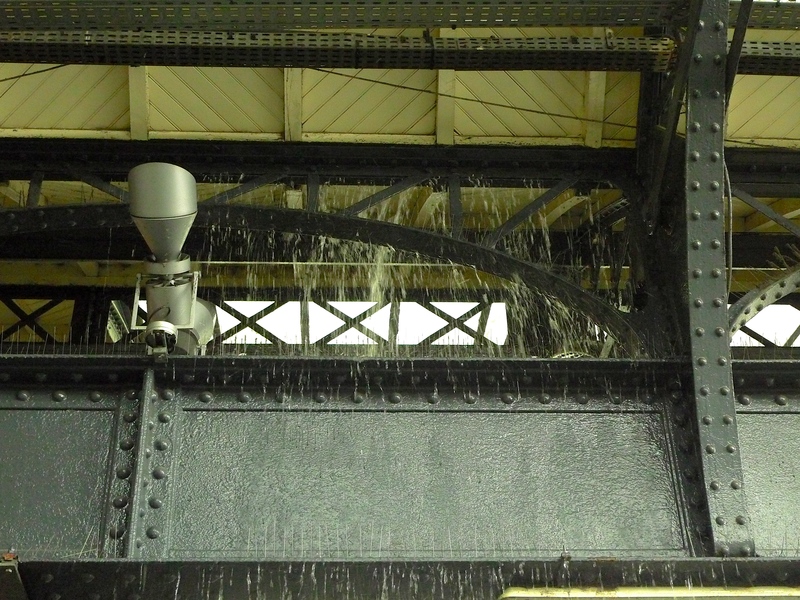 My exploration of the sounds of the Gare de l’Est took an unexpected turn when, in the midst of a very hot and very humid early August afternoon, a short, sharp, rainstorm of tropical proportions appeared seemingly out of nowhere. I learned pretty quickly that when it rains the Gare de l’Est is far from waterproof. 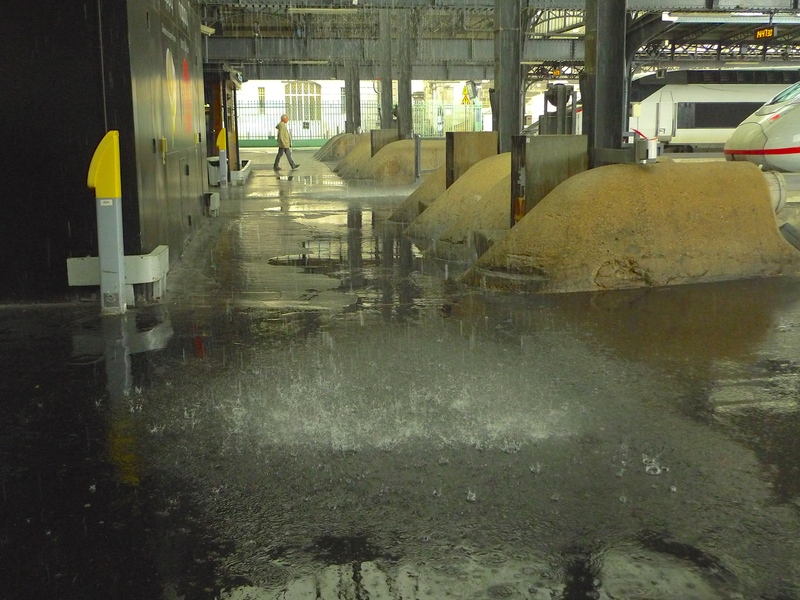 Not only did the rain splatter the trains waiting at the platforms but it also bounced off the entrance to the platforms as well. And it also seemed to permeate through every available nook and cranny. But the rain soon passed and the station was quickly returned to the balm of a summer’s afternoon. I couldn’t help wondering though how the sounds I’d recorded in the Gare de l’Est in early August 2014 would compare to the sounds to be heard in the same station one hundred years ago in August 1914 as a generation of young men set off to a conflict from which few would return. WHEN I TRAVEL IN Paris I mostly use either the Métro or the buses but rarely the RER. The RER, or Réseau Express Régional, of course does crisscross Paris but I only seem to use it when travelling further afield to the Parisian suburbs. 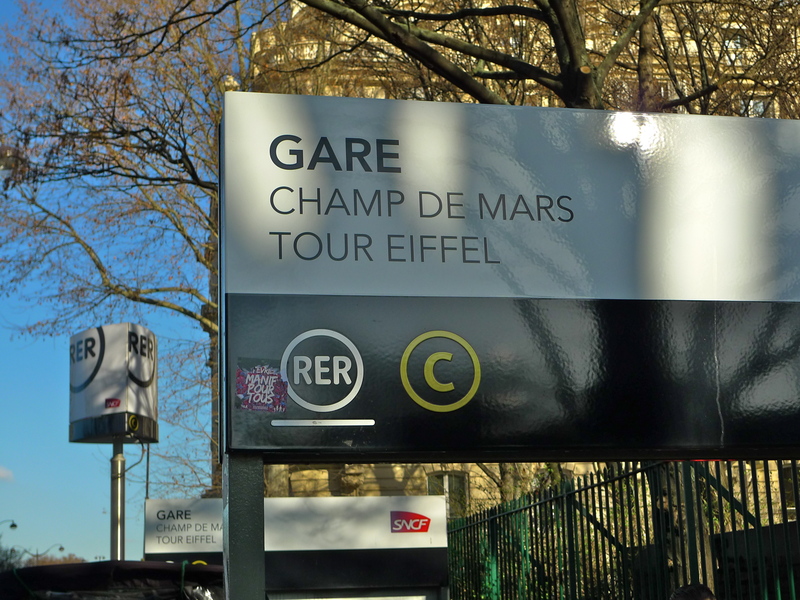 The other day I was on an RER train returning to Paris from a sound recording assignment in the suburbs when I alighted at the RER station ‘Champs de Mars – Tour Eiffel’. Although I pass this station frequently on my regular 82 bus journeys I had never actually been inside so I took this opportunity to have a look round and, of course, to capture the atmosphere in sound. 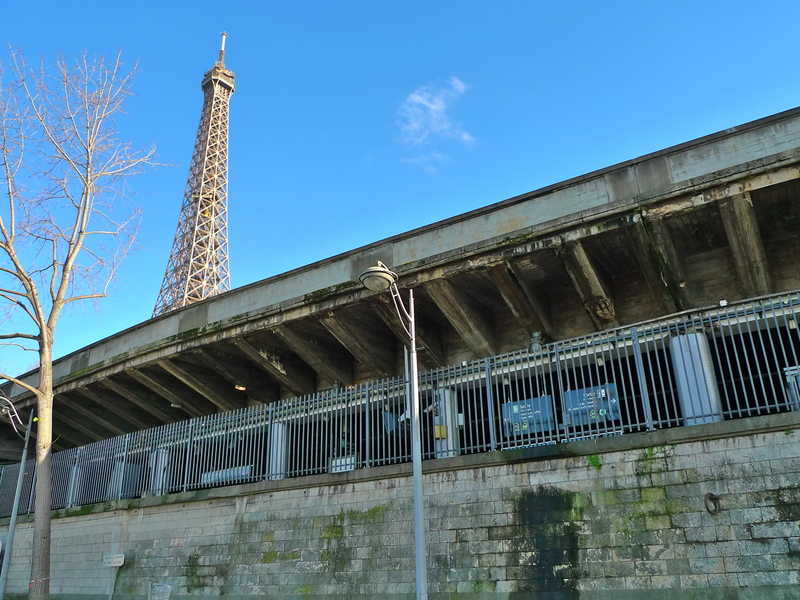 … and the other further along the Quai Branly at the Pont Bir-Hakeim. Entering the station from the entrance close to the Avenue de Suffren the unassuming feel continues. 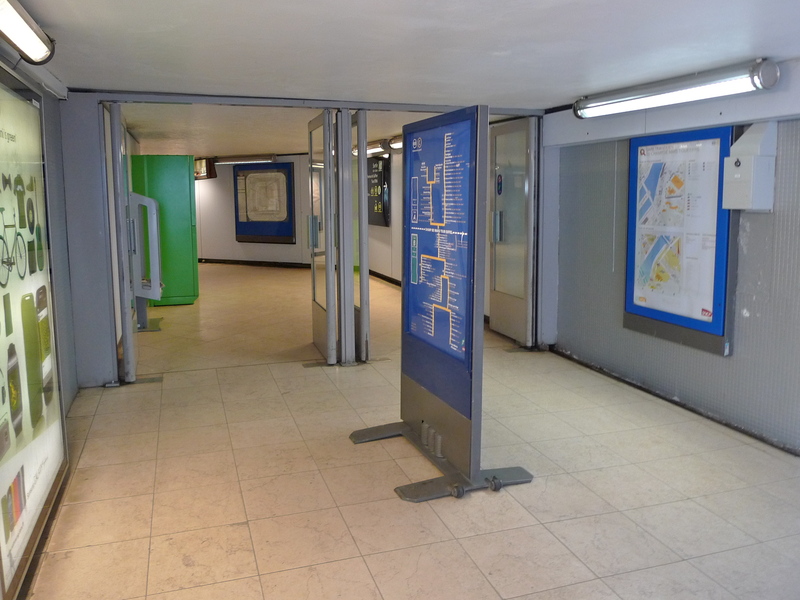 There is no huge concourse but rather a narrow corridor leading to the ticket barrier. There are only two platforms at the station conveniently named ‘A’ and ‘B’ and the signage is good too, which is just as well since thousands of tourists use this station to get to and from the most visited attraction in Paris, Le Tour Eiffel. Many tourists wanting to venture from the city centre to the Palace of Versailles also use this station. It’s only once you pass the ticket barrier and have figured out which platform you need (for the Palace of Versailles you need Platform ‘A’ by the way) that you begin to get a different feel for this station. The sweeping platforms are very long and from Platform ‘B’ you can look out across La Seine. 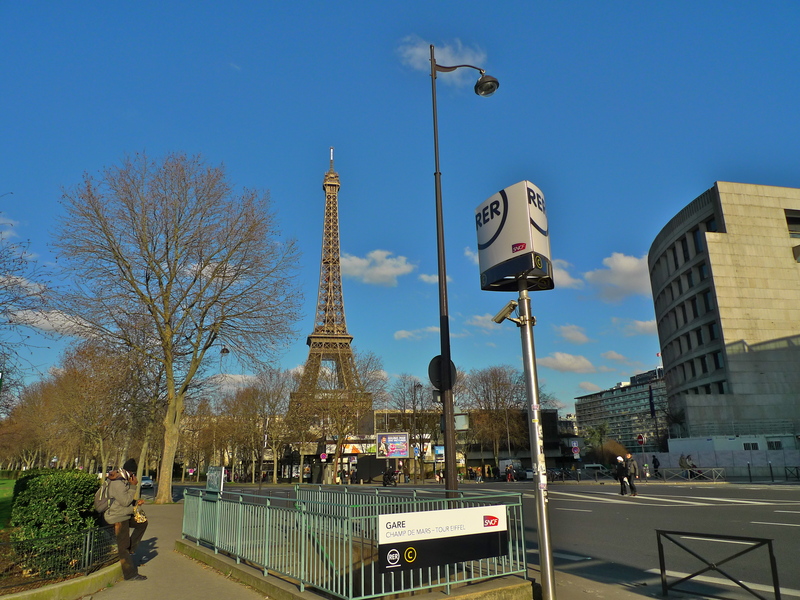 Today’s Champs de Mars – Tour Eiffel station dates from 1988 when the Vallée de Montmorency – Invalides branch of RER Line ‘C’ opened. This stretch of line used a large part of the infrastructure of the former ligne de petite ceinture dating from 1867. Today’s station may have only been here since 1988 but it is in fact the fifth railway station to have occupied this site. 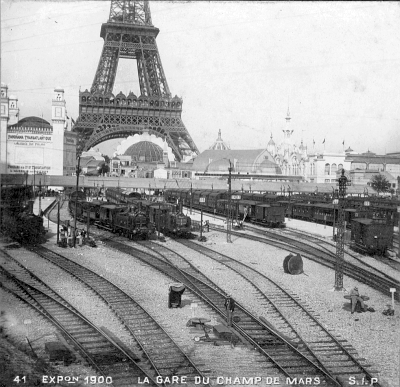 The first Gare du Champs de Mars was built to connect the Petite-Ceinture to the Champ de Mars and the site of the 1867 Exposition Universelle, or World’s Fair. 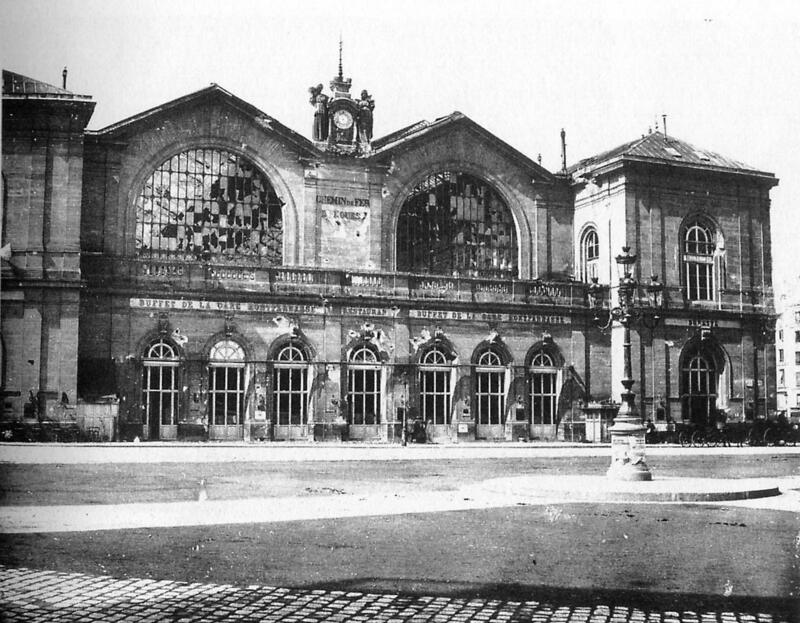 This station was demolished shortly after the Exposition. For the 1878 Exposition Universelle, again held in Paris on the Champs de Mars, another Gare du Champs de Mars was built. This station was designed and built by the French architect, Juste Lisch who, amongst other things, also designed the Gare Saint-Lazare in Paris. This station survived longer than its predecessor and it was used for the 1889 Exposition Universelle as well. 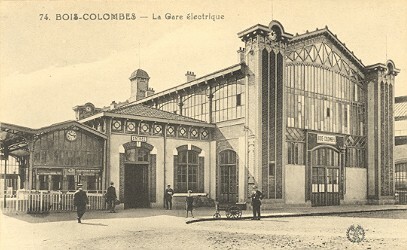 In 1897 though the station was demolished and moved to Bois-Colombes on the outskirts of Paris. 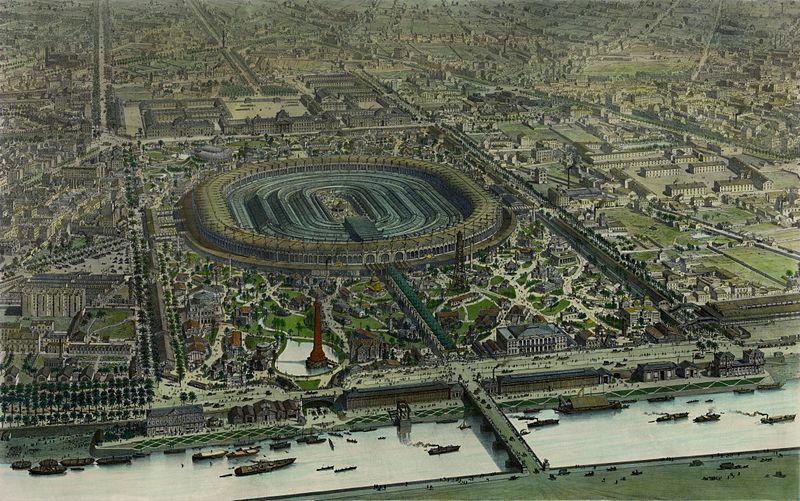 For the 1900 Exposition Universelle, this time featuring the newly built Tour Eiffel, another Gare du Champs de Mars was built and the line was moved closer to la Seine and extended to Invalides. As well as a station for passengers, a goods station was built close by between the Avenue de Suffren and the Boulevard de Grenelle. After the 1900 Exposition the passenger station was closed, the goods station became a coal depot and from 1937 it was transformed into engine sheds. The former goods station was finally closed in 1971. Although the 1900 Gare du Champs de Mars no longer exists it is possible to imagine something of it by walking along the Promenade du quai Branly between the Pont d’Iéna (opposite the Tour Eiffel) and the Pont Bir-Hakeim and looking back towards the Tour Eiffel. Along this stretch of the Promenade du quai Branly some of the original wall of the 1900 station remains. The Gare du Champs de Mars and its association with the Expositions Universelle held in the Champs de Mars close by is of interest to me partly because I find the history of these Expos fascinating (Paris also hosted the 1937 one as well) but also because Paris is bidding to hold the Exposition Universelle in 2025. It just so happens that my local Mayor and Deputé (Member of Parliament) is leading the bid so I must ask him if we can expect yet another new Gare du Champs de Mars in 2025! 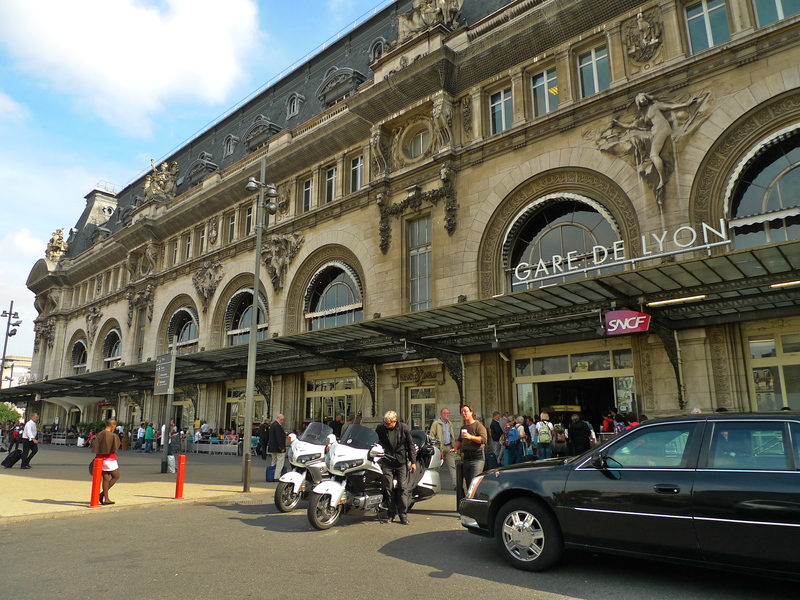 THE GARE DE LYON is one of the six main line railway stations in Paris. The Gare du Nord with 190 million passengers a year is the busiest railway station in Paris, in France and in Europe so, with around 90 million passengers a year, the Gare de Lyon is some way behind but still ranked as the third busiest railway station in France. 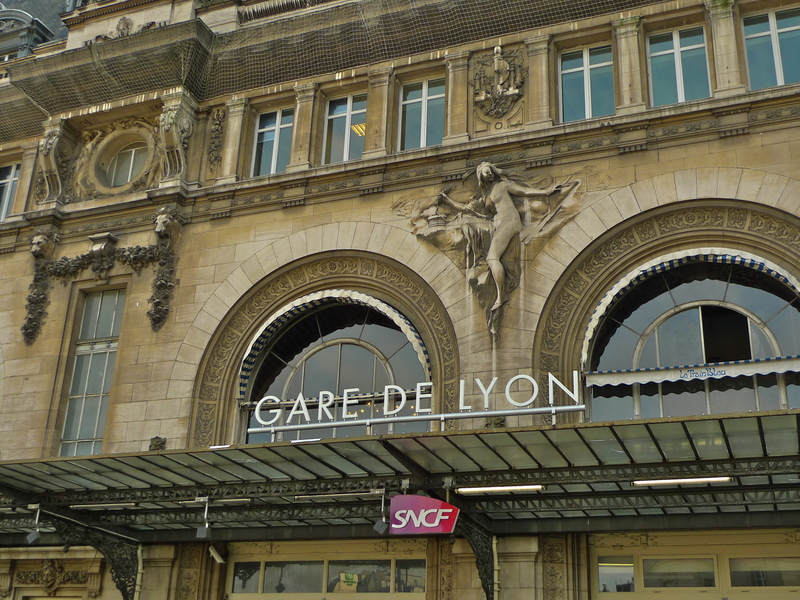 Named after the city of Lyon, the Gare de Lyon is situated in the 12th arrondissement of Paris and it’s the northern terminus of the Paris – Marseille line. From here high-speed TGV trains travel to southern France as well as to Switzerland, Italy and Spain. The station also hosts regional trains as well as an RER and Métro station. The first station on this site was built in 1852 by the Compagnie des chemins de fer de Paris à Lyon et à la Méditerranée (known as PLM). PLM operated chiefly in the southeast of France with a main line connecting Paris to the Côte d’Azur by way of Dijon, Lyon, and Marseille. This station was a rather drab and low-key affair which, even after being enlarged four times, was continually swamped by the number of passengers passing through. By the 1890’s, with the station unable to cope with the volume of traffic and with the prestigious Exposition Universelle coming up in 1900 it was decided to replace the old station with a new one. The task of building of the new station fell to the French architect Marius Toudoire but the work fell behind schedule and the Gare de Lyon that we know today was eventually opened in 1902. The design of the Gare de Lyon conceals the working station behind a monumental stone frontage with echoes ranging from the French 17th Century to the northern Italian Renaissance the most significant feature of which is the 64 metre high clock tower positioned so as to be visible from Place de la Bastille. 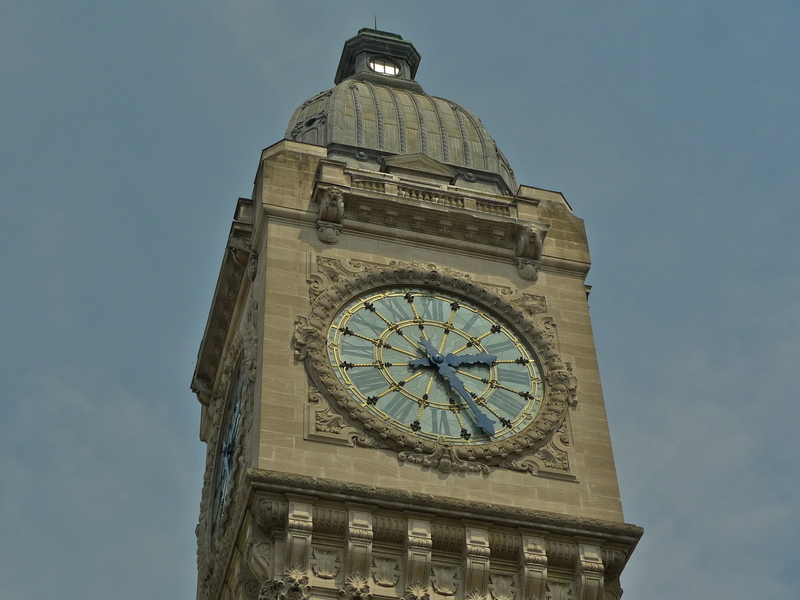 The clock tower may be the most significant feature of the Gare de Lyon on the outside but on the inside that accolade must surely go to the magnificent restaurant, Le Train Bleu, once rather unassumingly called the “Buffet de la Gare de Lyon”. But an ordinary station buffet it most certainly is not! 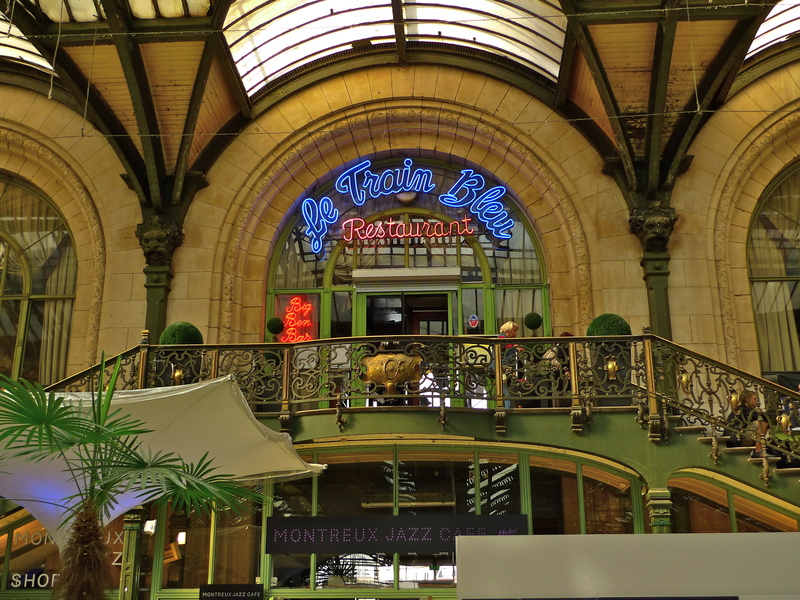 The Buffet de la Gare de Lyon changed its name to Le Train Bleu in 1963 to celebrate the “Paris-Vintimiglia” service, the luxury French night express train, which operated from 1886 to 2003. Colloquially referred to as Le Train Bleu (the Blue Train) because of its dark blue sleeping cars it gained international fame as the preferred train of wealthy and famous passengers between Calais and the French Riviera. 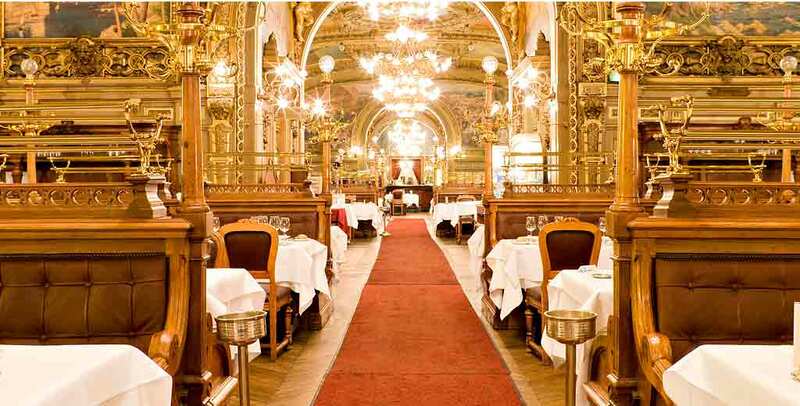 Inside, Le Train Bleu is richly decorated with caryatides, rococo mermaids, exquisite gilding, mirrors and 41 murals painted by 30 renowned artists depicting scenes of Paris at the time of the Exposition Universelle as well as beautiful French landscapes from the route of the PLM railway. 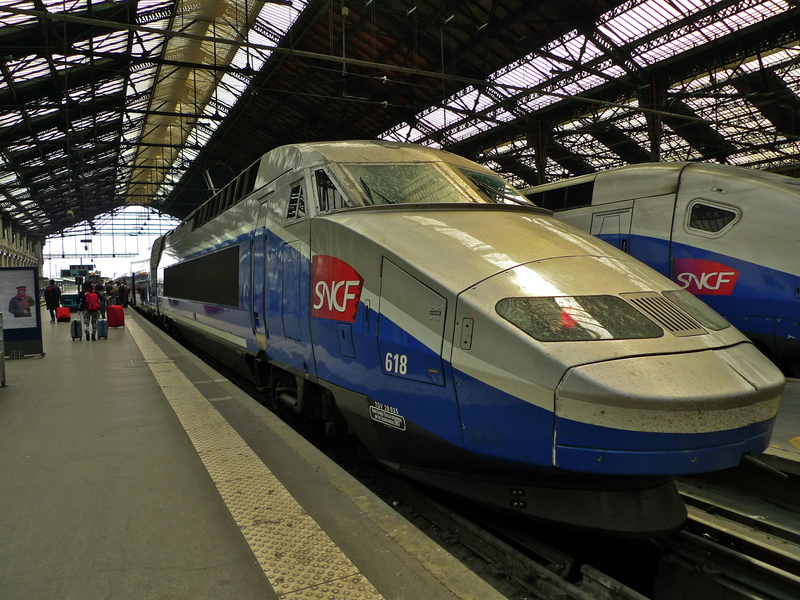 My soundwalk in the Gare de Lyon includes a walk along the regional train platforms, the main station concourse, the TGV train platforms and a walk right up to the Paris – Milan TGV train as the passengers were about to board. 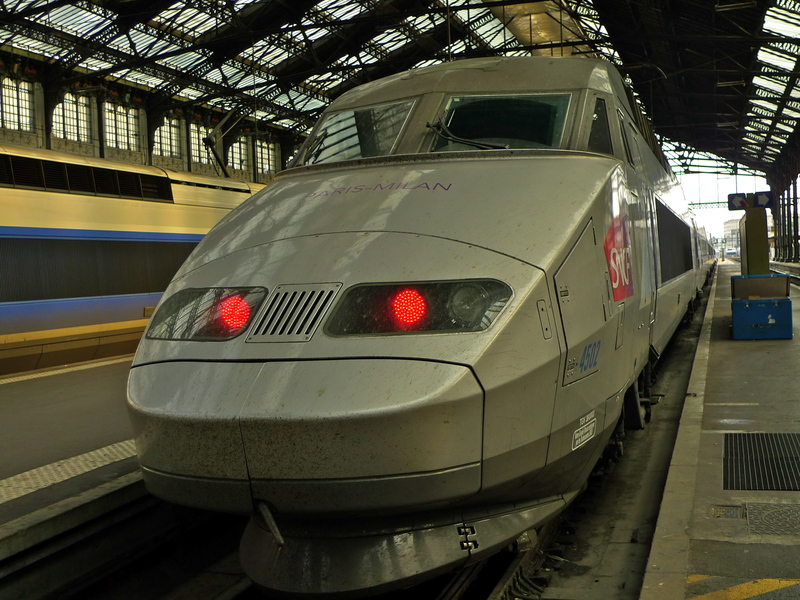 Today, it takes just three hours to travel by TGV from the Gare de Lyon to Marseille, around four hours to Geneva, about seven and a half hours to Milan and about eleven hours to Venice and, with a little forward planning, all at very reasonable prices. 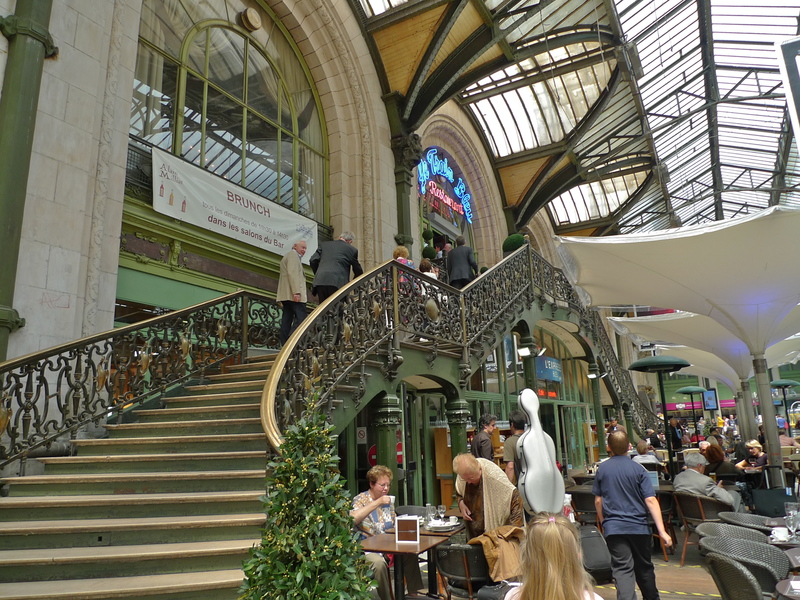 If you’ve enjoyed this post, you might also like my account of the sights and sounds of the Gare du Nord which you can find here. 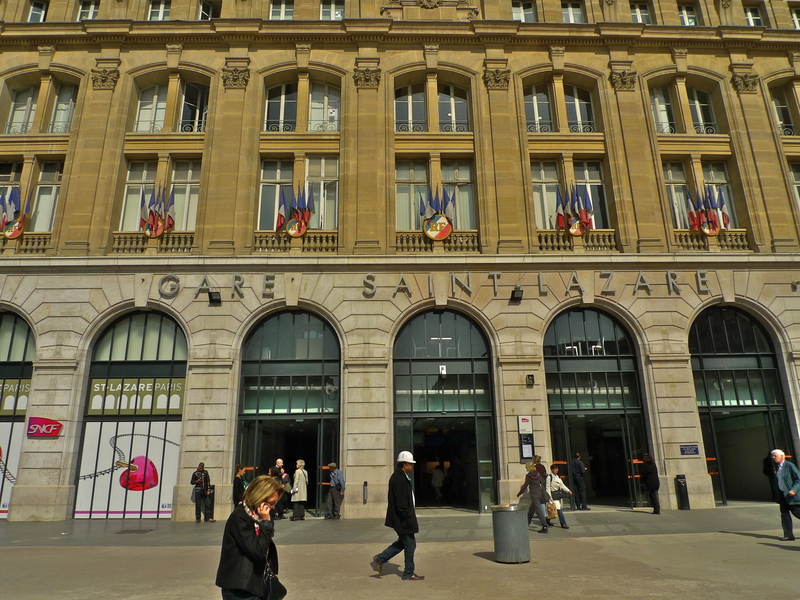 OPENED IN AUGUST 1837, the Gare Saint-Lazare is one of the six terminus railway stations in Paris. 450,000 passengers a day pass through this station and it’s the second busiest station in Paris after the Gare du Nord. 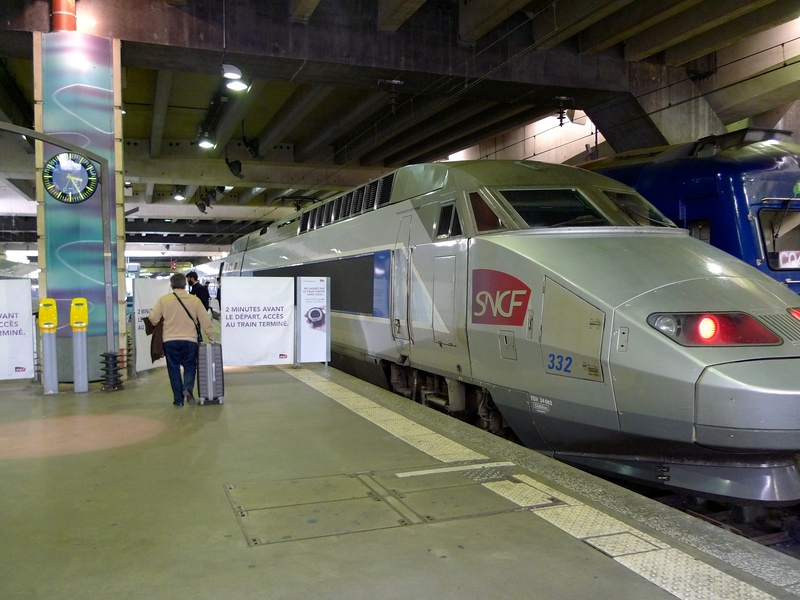 There are no high-speed TGV lines operating from the Gare Saint-Lazare but the services do include the long distance Intercités trains towards Normandy as well as the regional Transilien trains to the western suburbs of Paris. 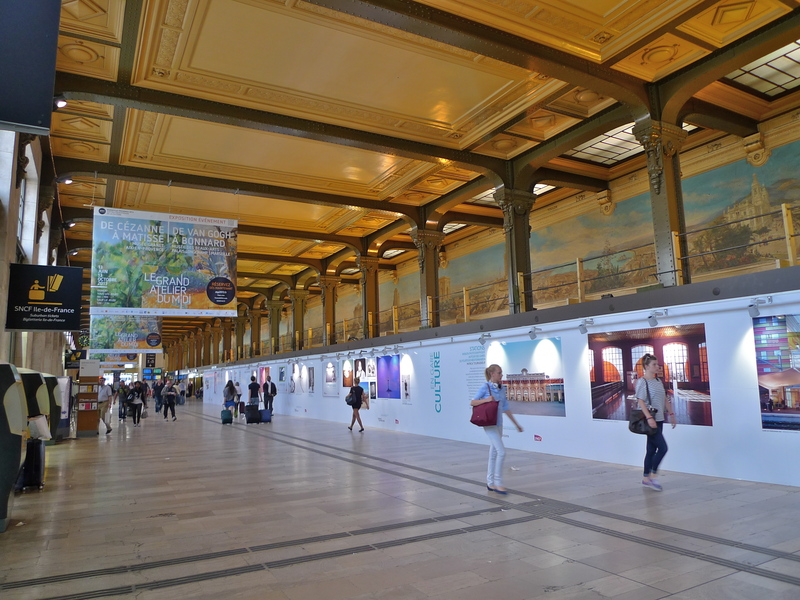 In recent times, the Gare Saint-Lazare has had a rather tired and weary look to it so it’s good to report that after almost three years of renovation work a new-look Gare Saint-Lazare finally opened to the public this week. 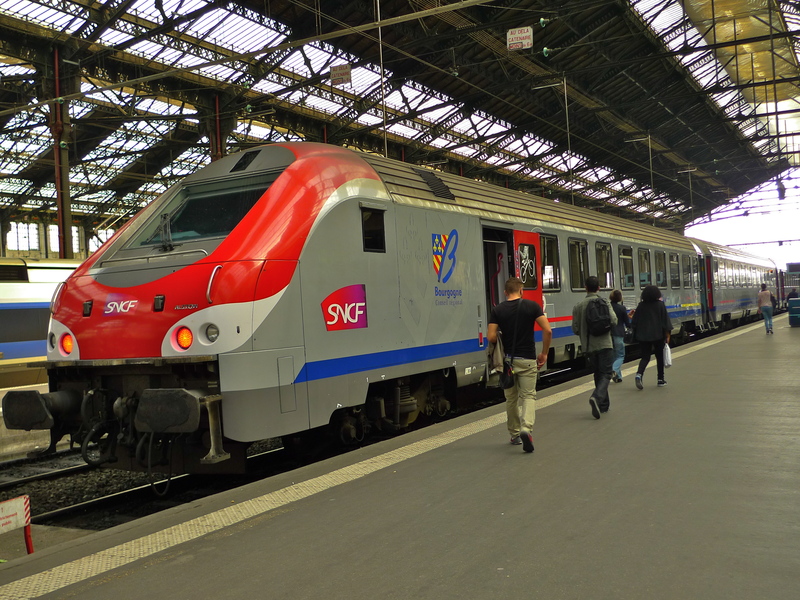 The €250 million project was funded partly by SNCF (Société Nationale des Chemins de fer français, France’s national state-owned railway company) and partly by private investment. The three level concourse was constructed while the station was fully operational for most of the time and that is a testament to the planning that went into the work. 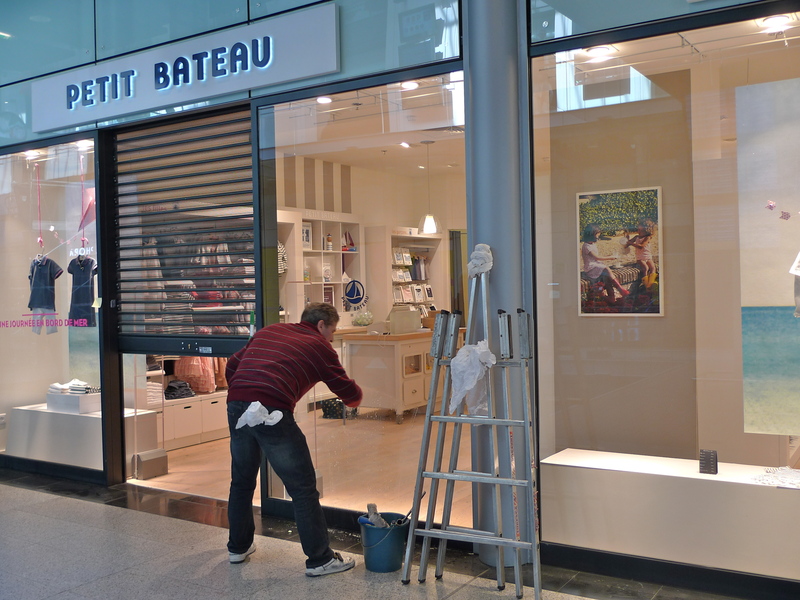 The new look station has 80 new shops to explore including familiar names such as Celio, Promod, Yves Rocher, Foot Locker, Camaïeu, Virgin, Sephora, Lush and L’Occitane. 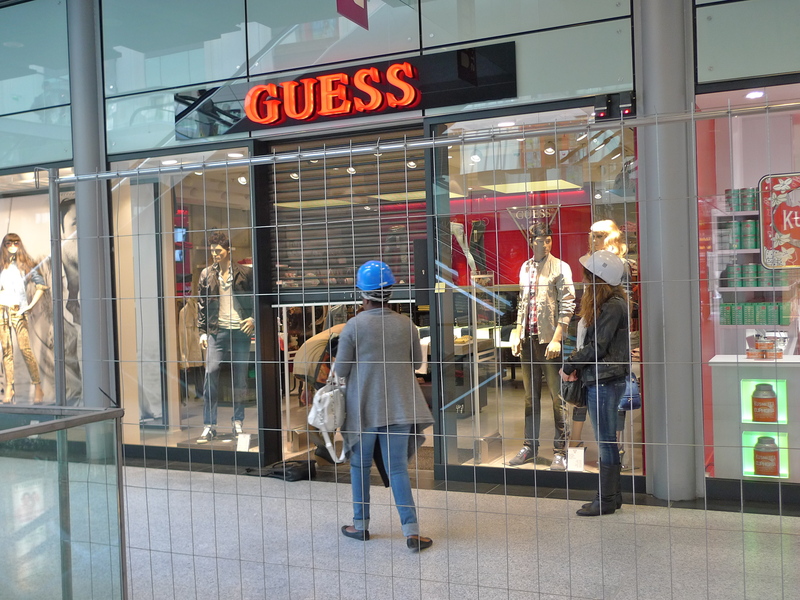 There are also some upmarket brands including Guess, Lacoste, Aigle, Passionata and Esprit. Although the concourse is now officially open the shops are for the most part still catching up and when I went few of them were actually open for business. The Gare Saint-Lazare is not a station I use all that often. Nevertheless, it’s good to see one of the least fashionable main terminus stations in Paris transformed into one of the smartest. At least the waiting time in the station will now be more entertaining for those addicted to shopping.